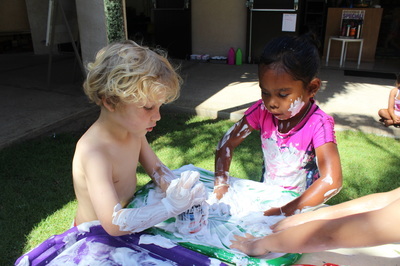 Since 1966, All Saints’ has been committed to nurturing and inspiring our students to “Realize Their Personal Best” amid a loving, innovative, and dynamic early childhood educational environment. 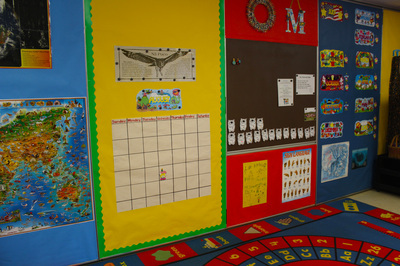 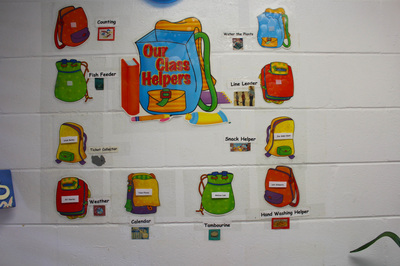 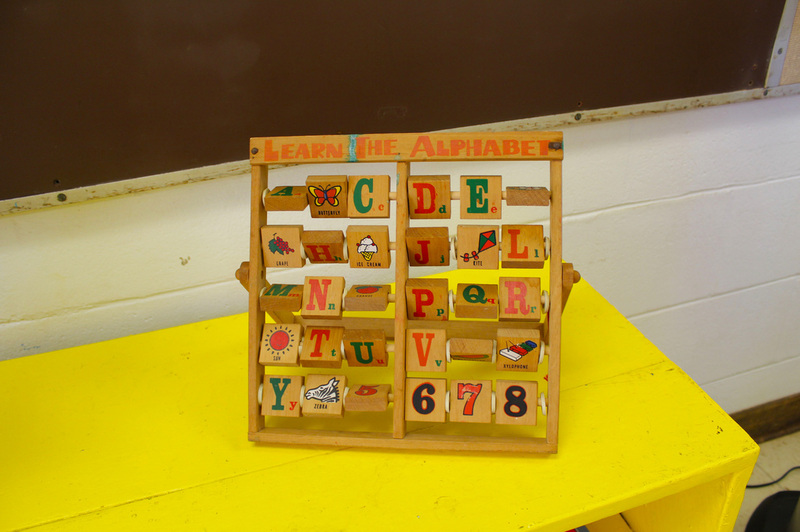 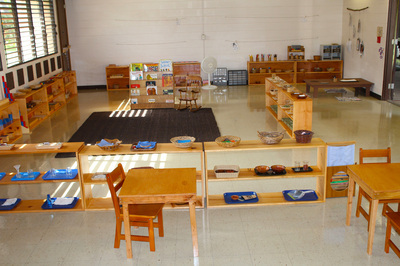 All Saints’ Preschool serves students age 2 years, 10 months to 6 years old. 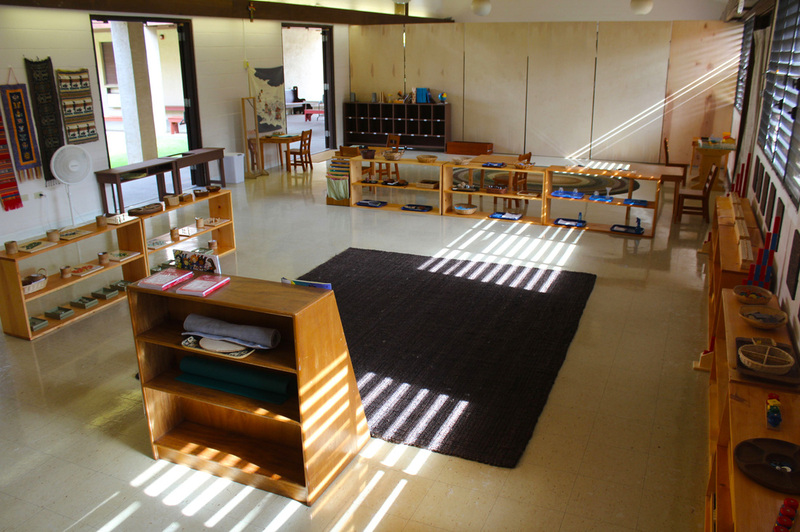 Our goal is to provide the foundation necessary for our students to thrive emotionally, physically, intellectually, socially, and spiritually. With each child entrusted to our care, we are devoted to building their self-esteem, instilling a passion for learning, and fostering their ethical and moral development. 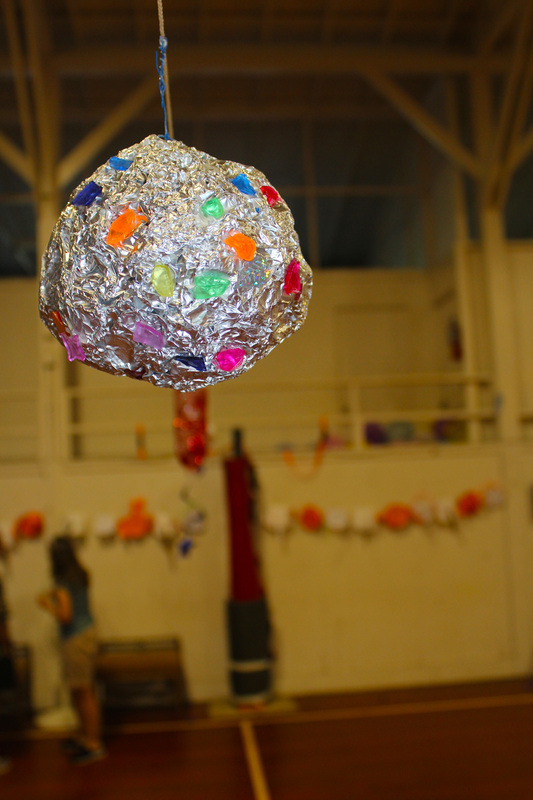 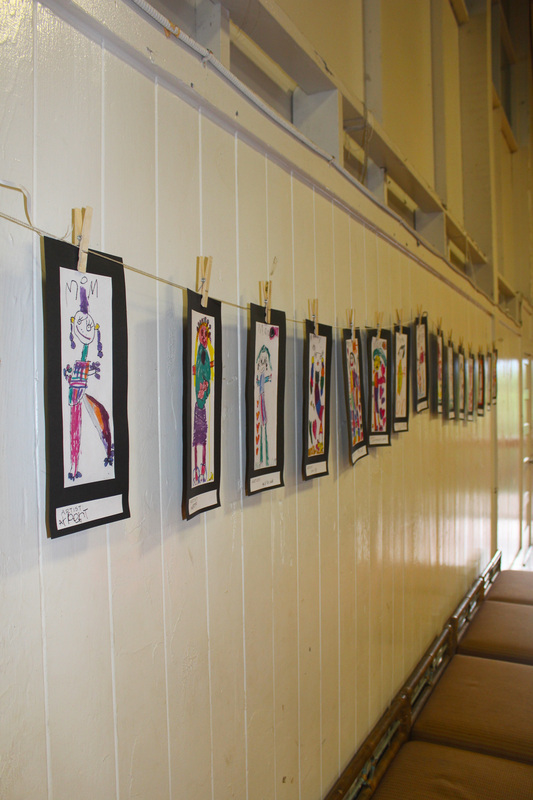 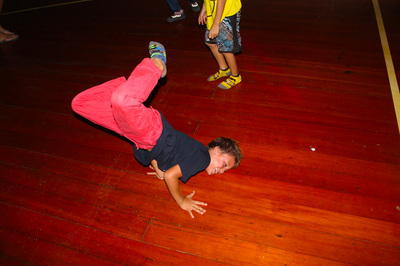 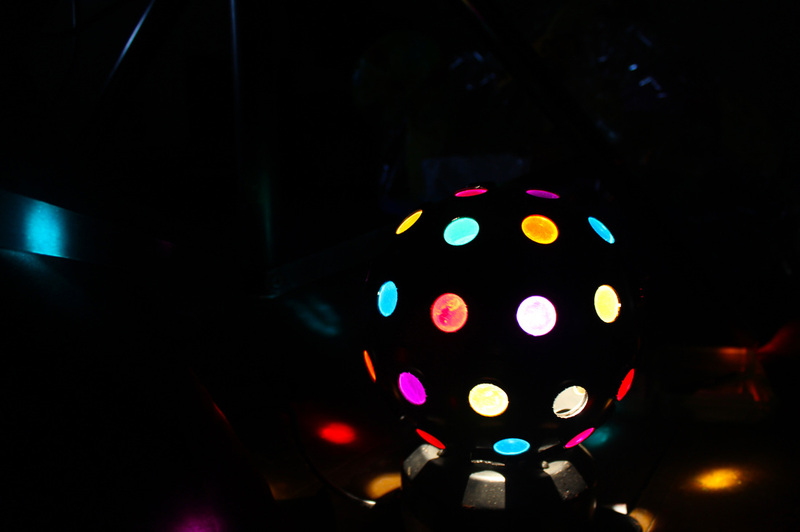 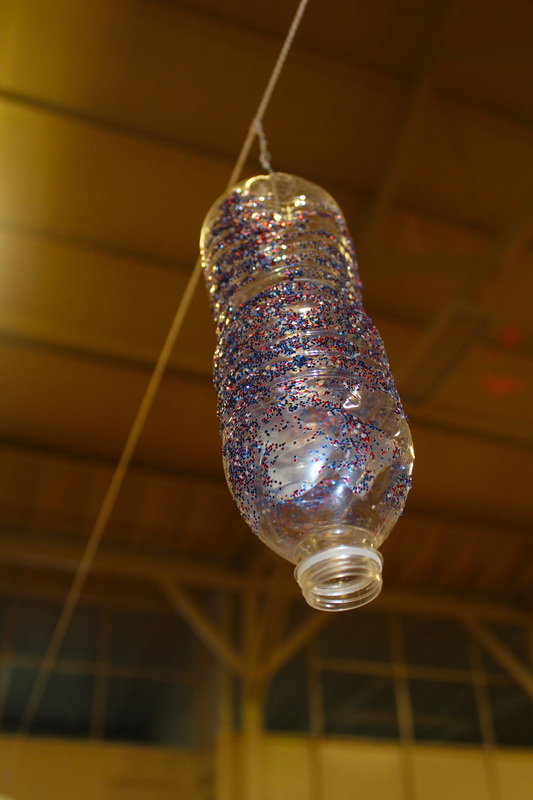 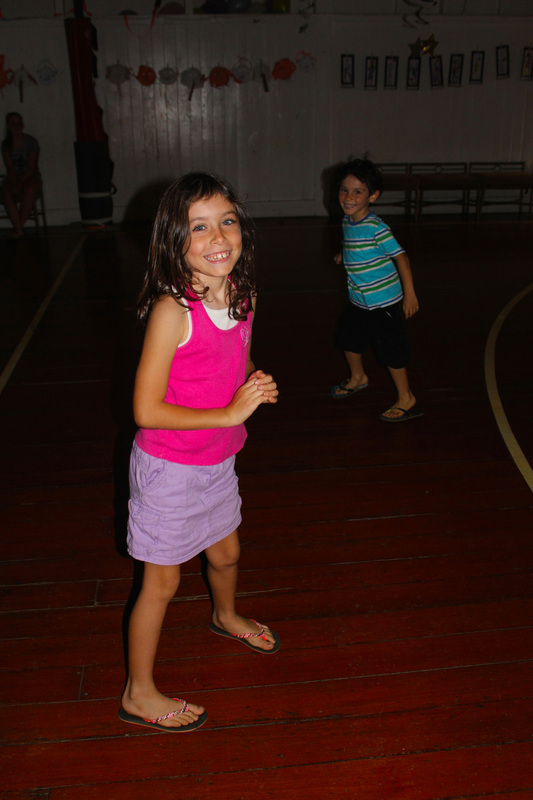 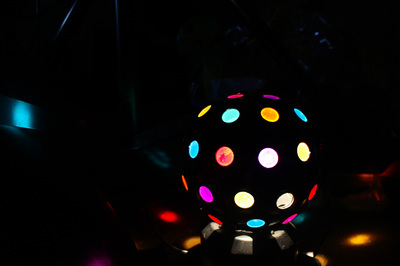 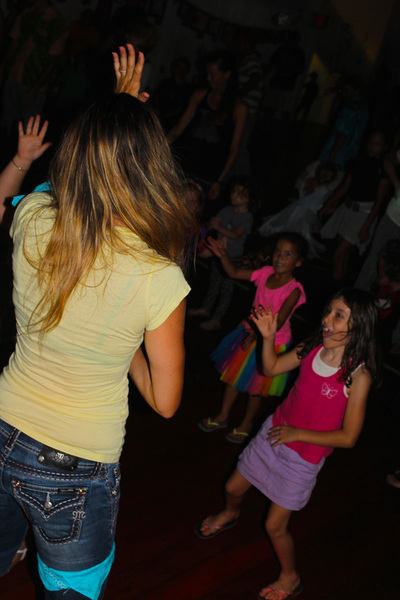 Our experienced and passionate team of educators create an atmosphere that offers an appropriate balance between academics and creative expression—with an emphasis on having fun! 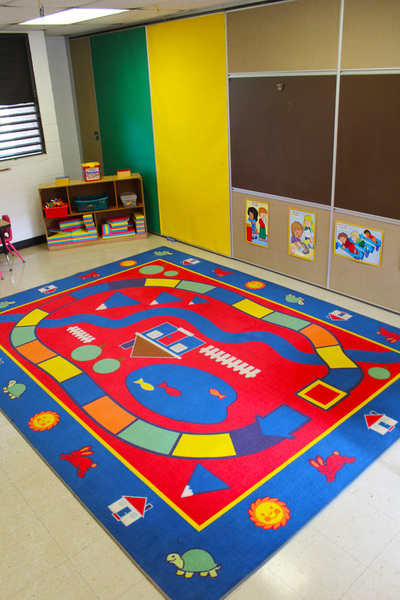 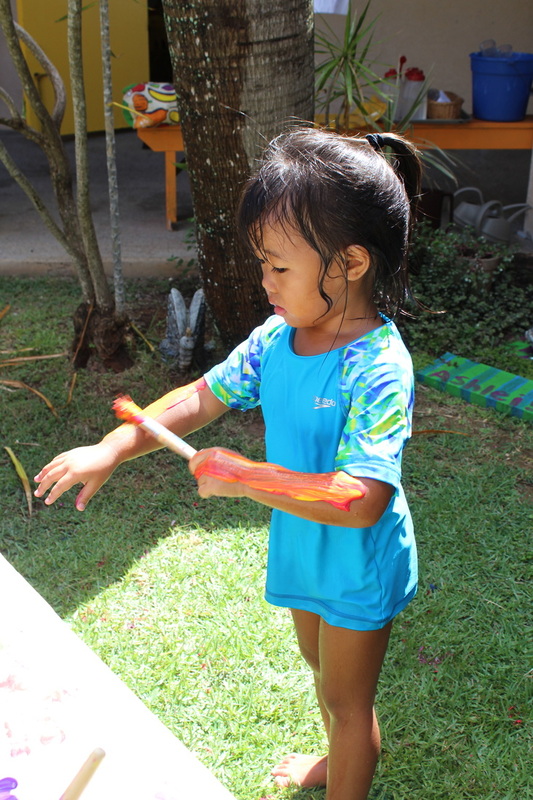 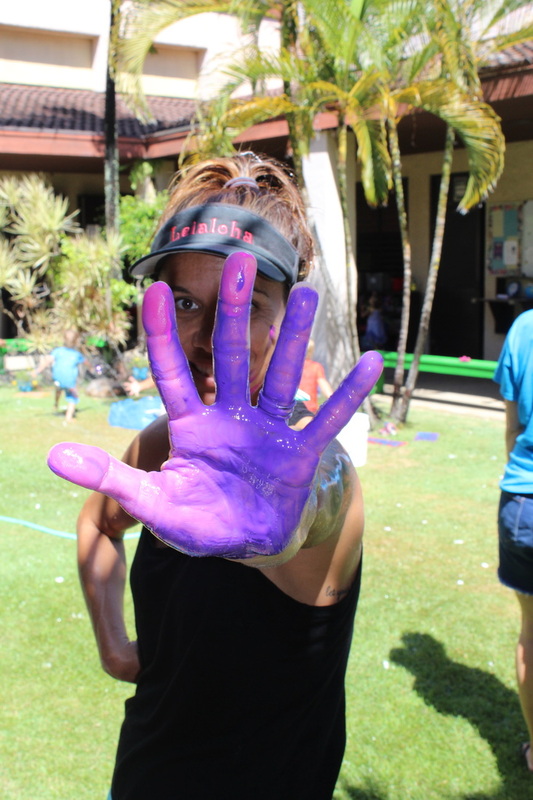 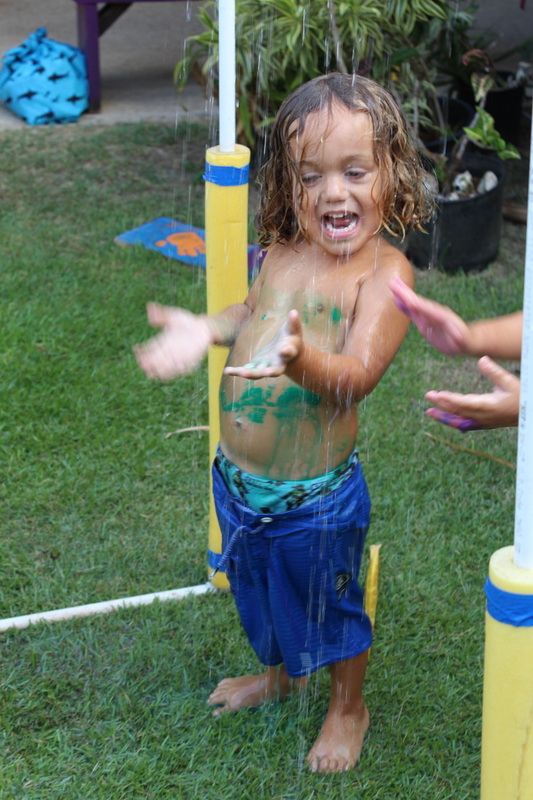 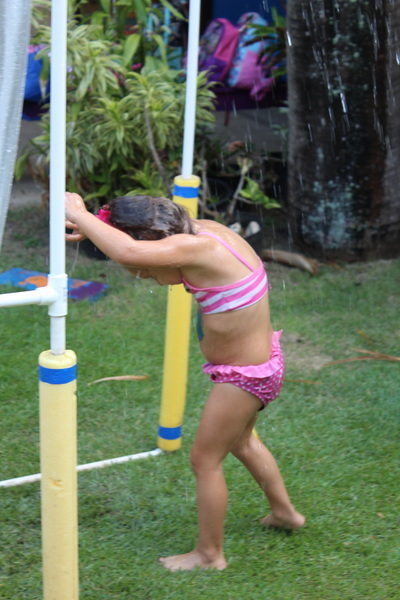 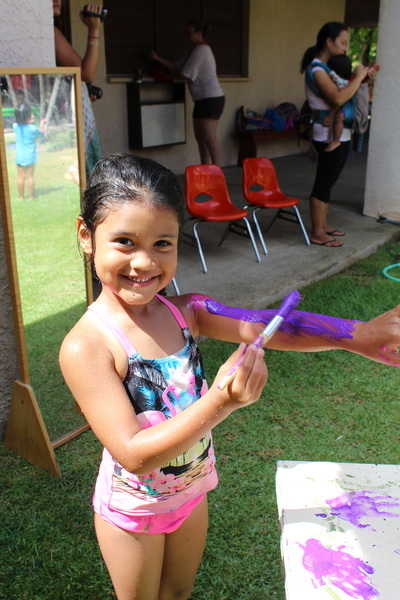 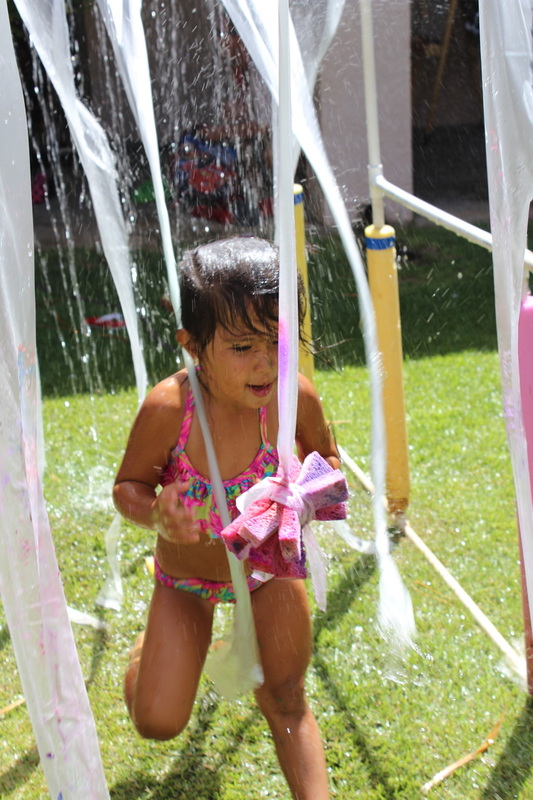 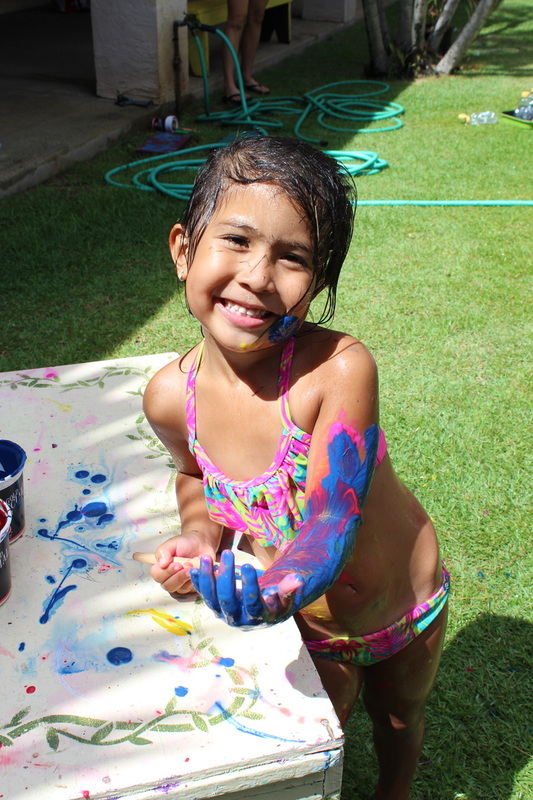 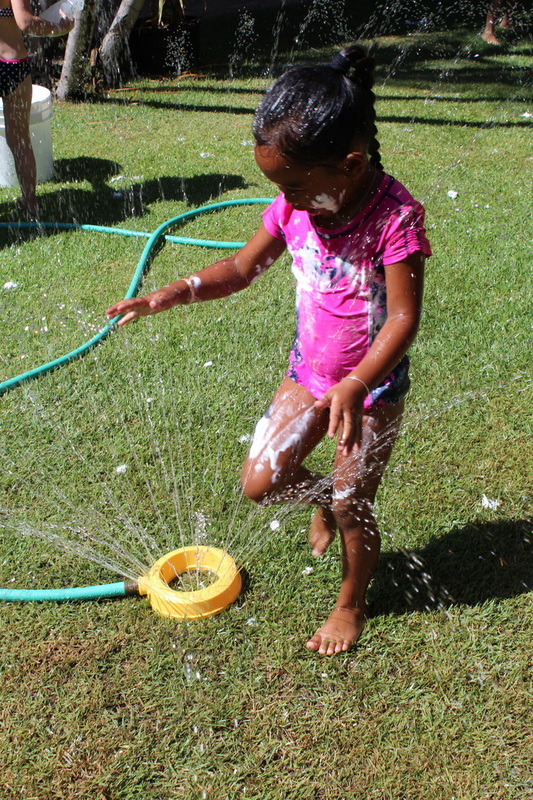 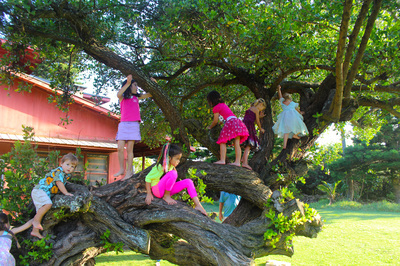 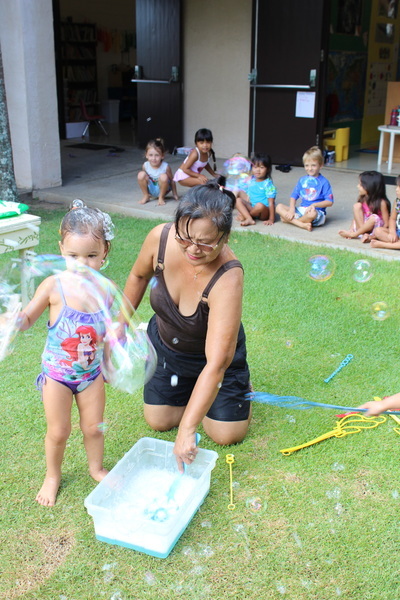 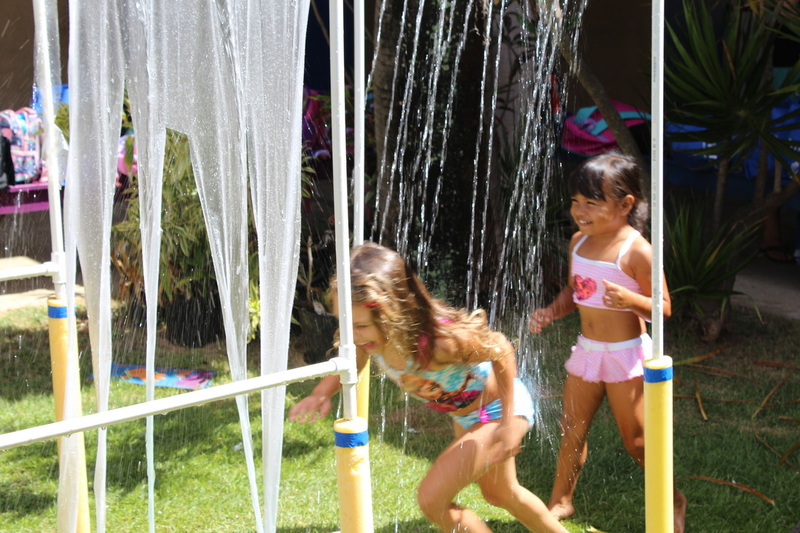 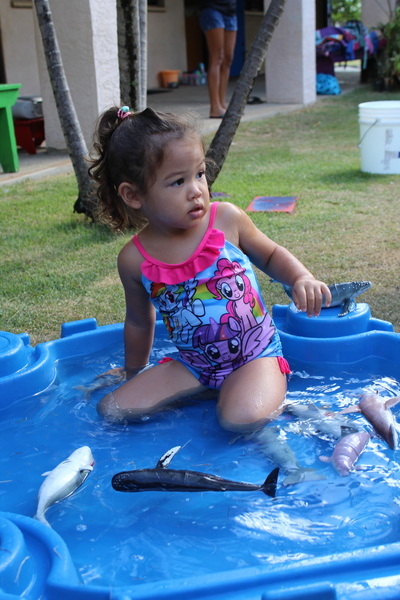 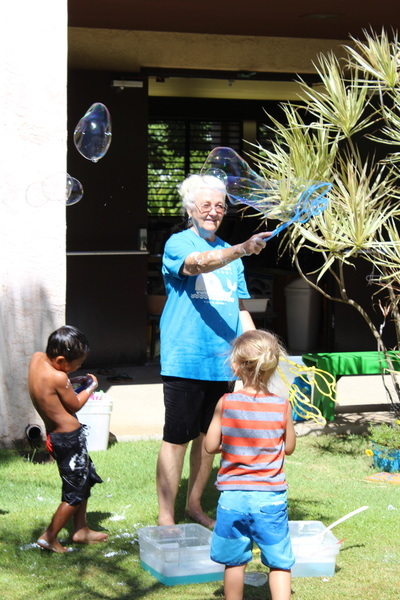 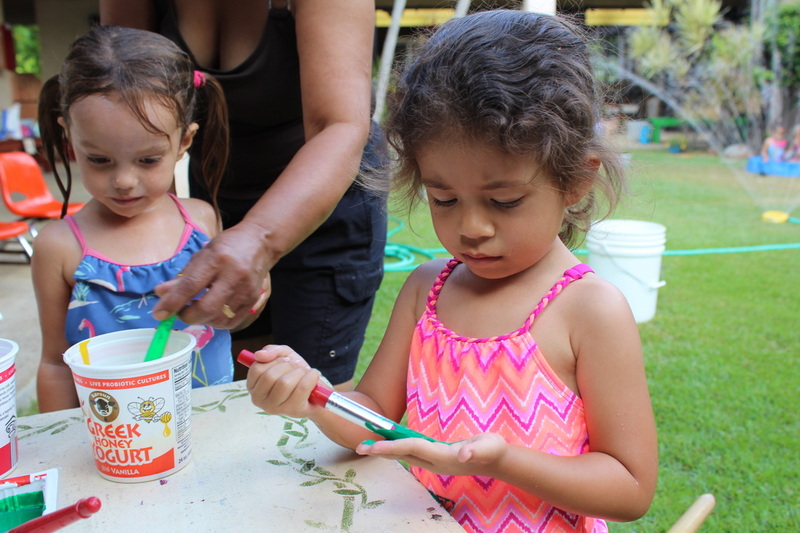 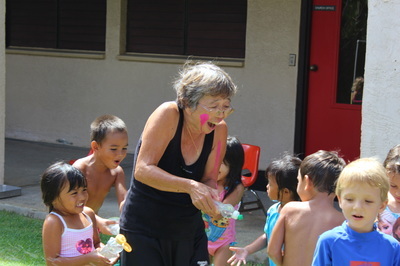 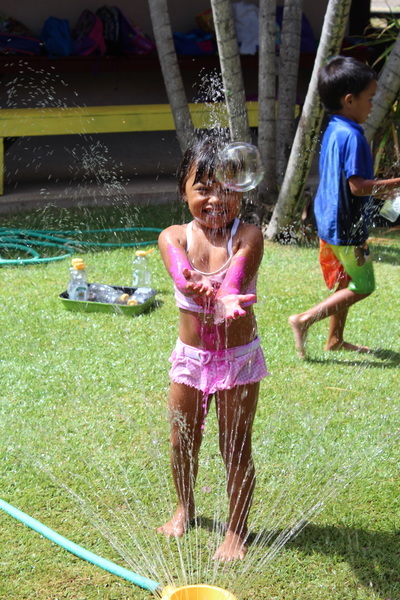 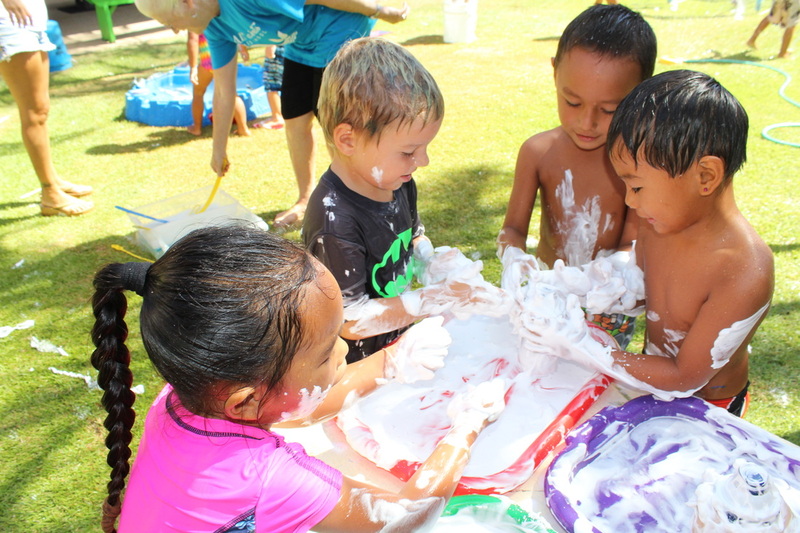 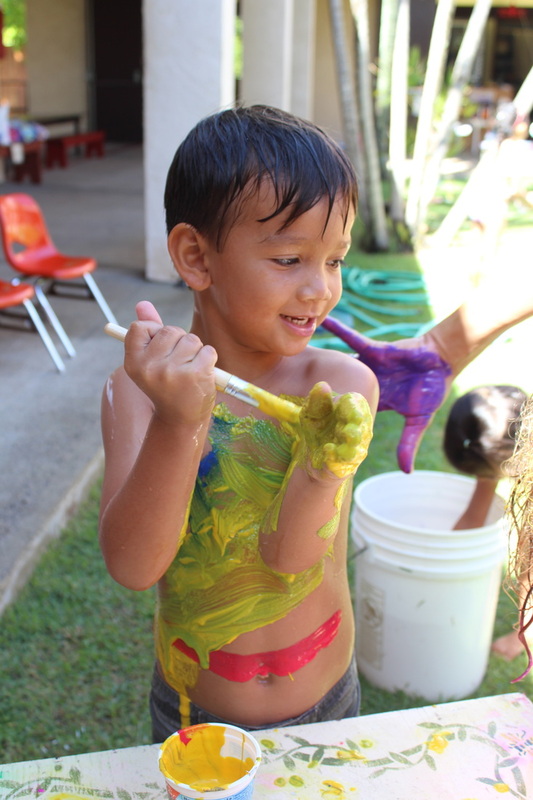 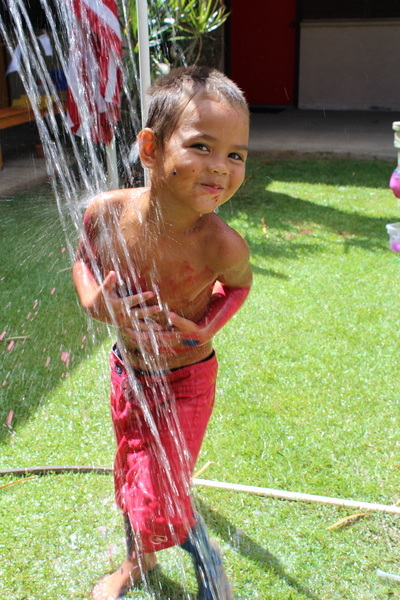 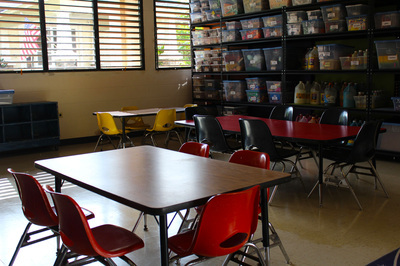 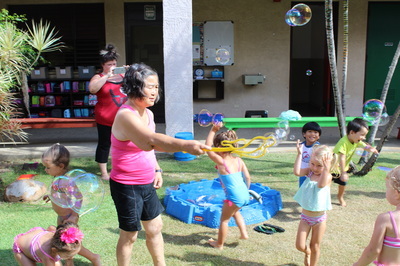 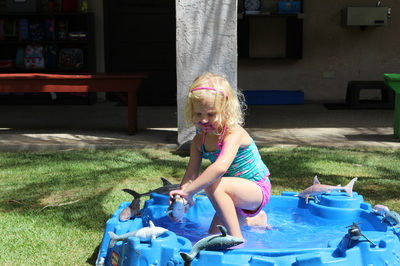 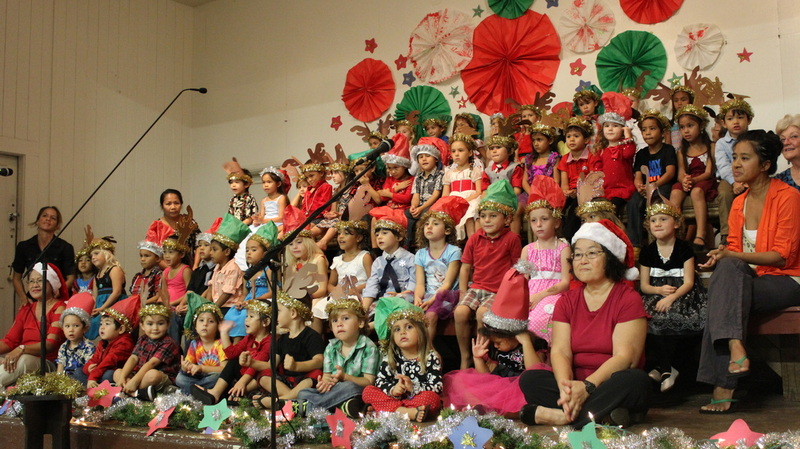 All Saints’ is committed to providing an exceptional, community-based preschool experience with Kauai’s most experienced early childhood educators. 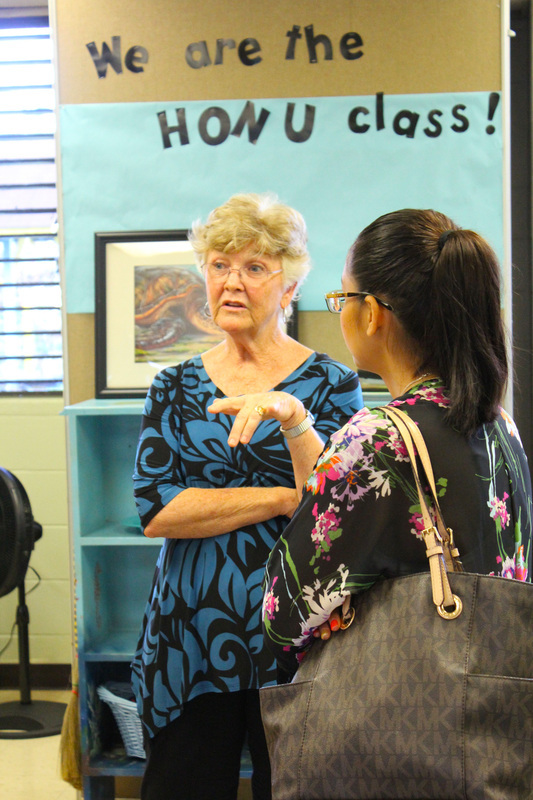 Our staff members, from our lead teachers to our support-staff, are all seasoned educators and professionals, most who have served at All Saints’ for many years. 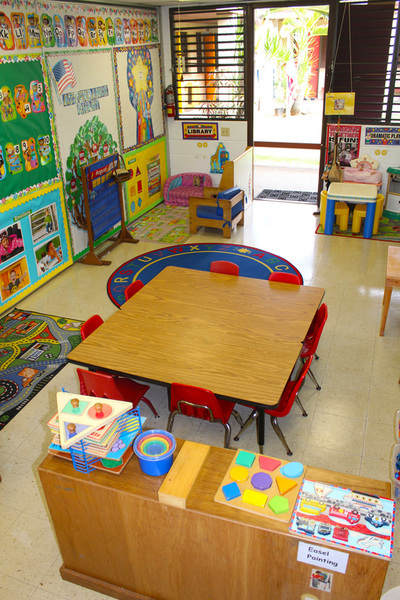 All Saints’ is not a daycare program with elements of a preschool environment. We are an early childhood education center and our staff members are educators committed to nurturing, inspiring, and teaching your children. 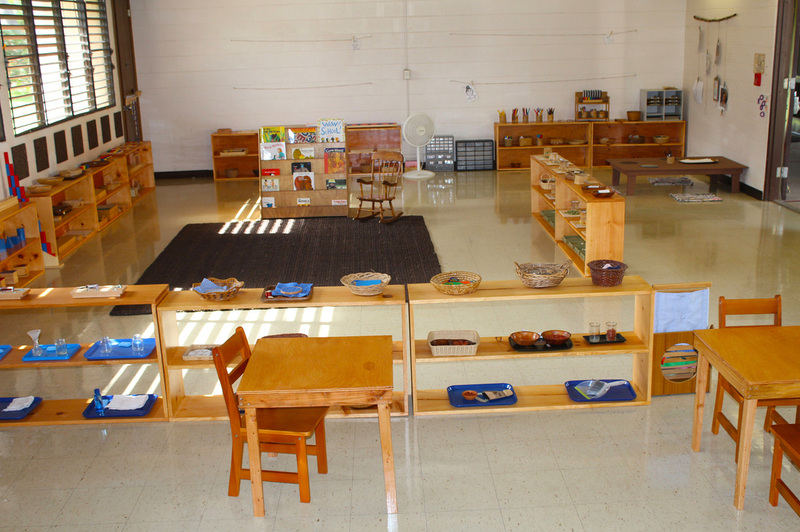 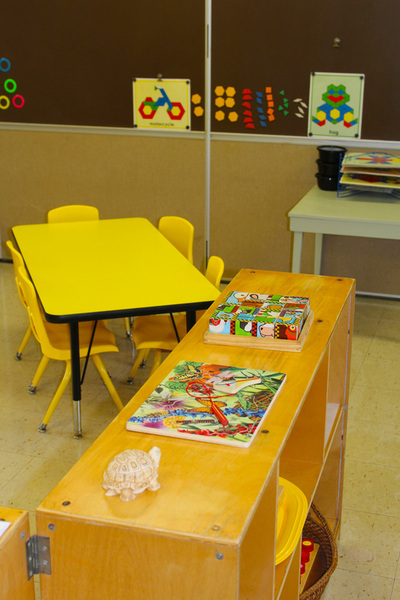 All of our classroom programs are innovative and exceptional learning environments that integrate both traditional and contemporary early childhood education practices. Please complete the application form along with the $50 registration fee, return it to the office as soon as possible. 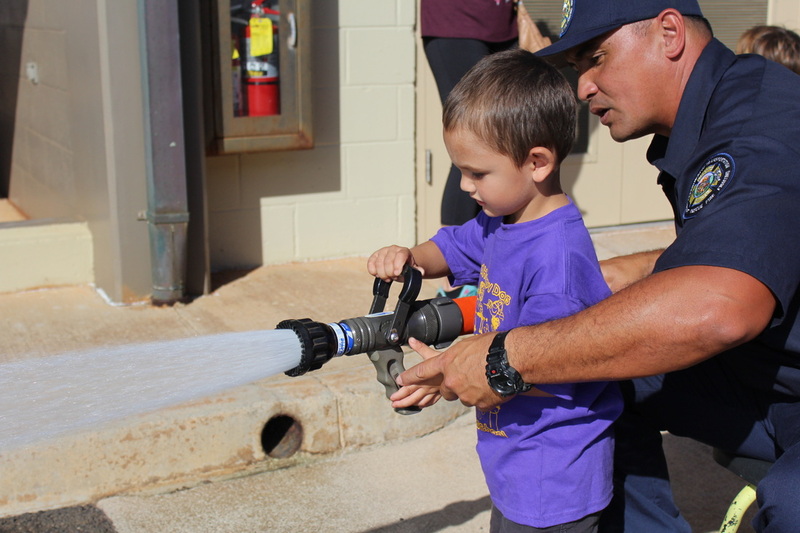 As it states on the form, applications will be considered in the order they are received, and must include the $50 registration fee before an application is reviewed. 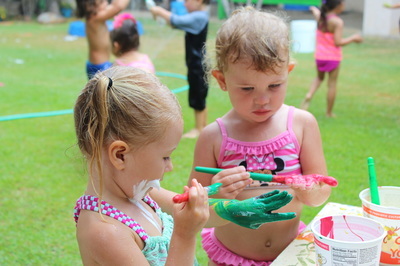 If accepted, additional paperwork, medical records, and a non-refundable tuition deposit of $400 will need to be submitted to finalize a child’s enrollment. 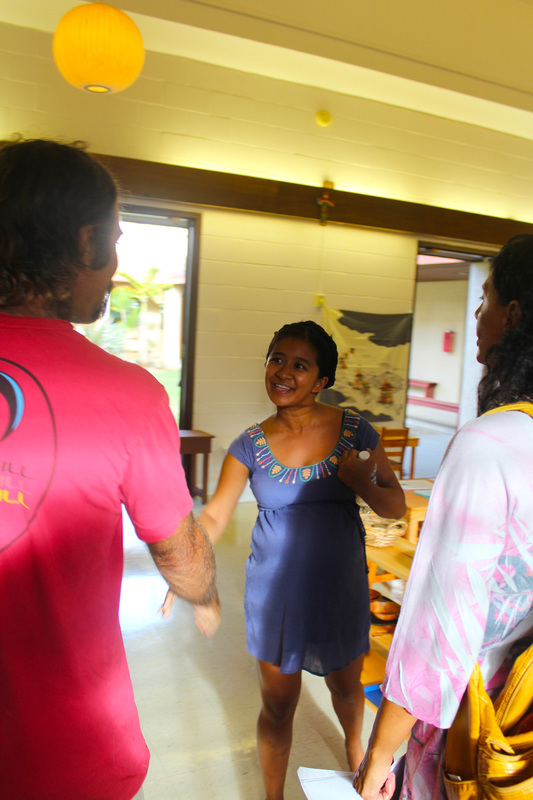 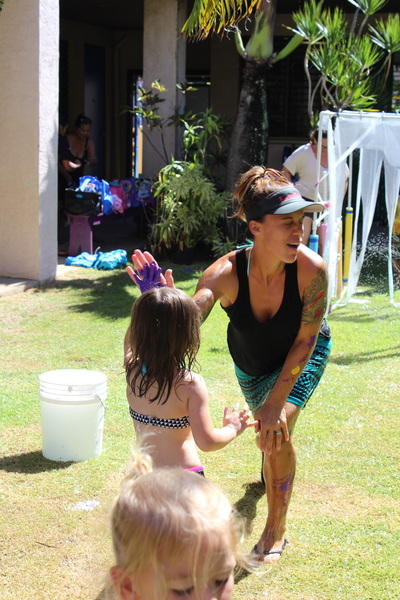 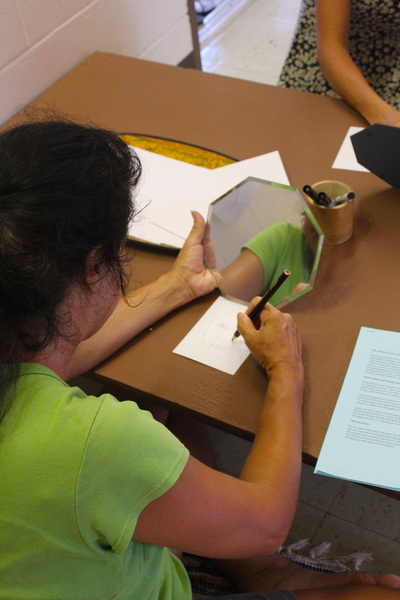 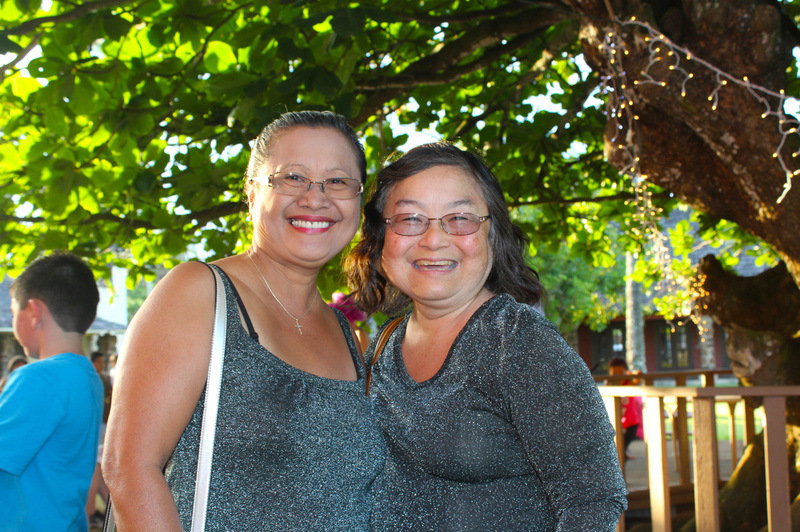 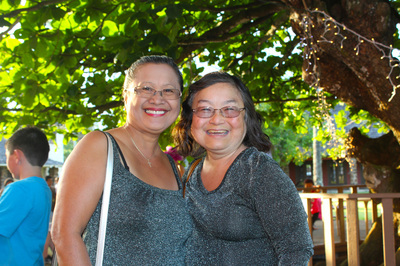 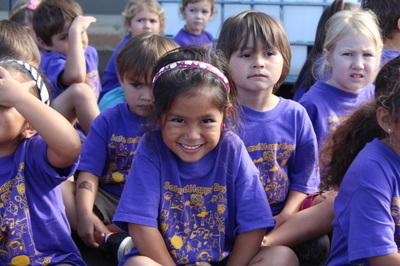 Our tuition reflects the financial commitment it takes to attract, retain, support, and empower Kauai’s most experienced early childhood educators. The decision to give your child an All Saints’ educational experience inherently brings a financial commitment. 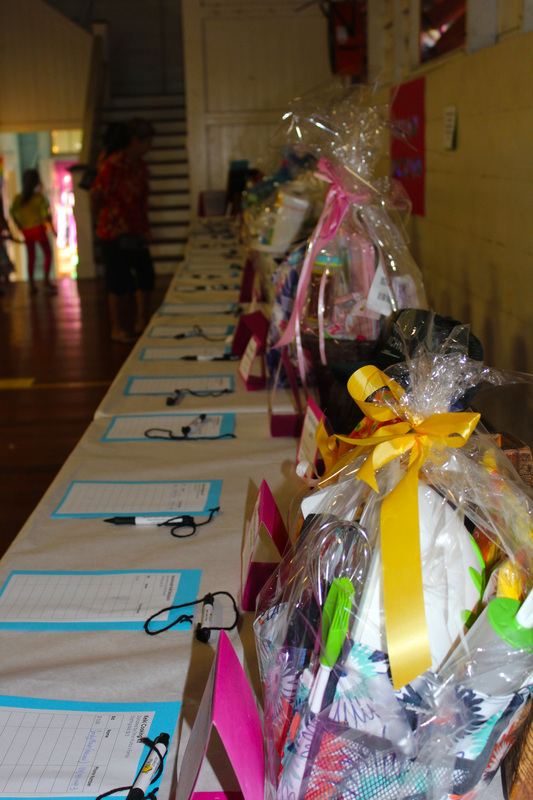 We understand that many of you will be making great sacrifices to have your children at All Saints’. 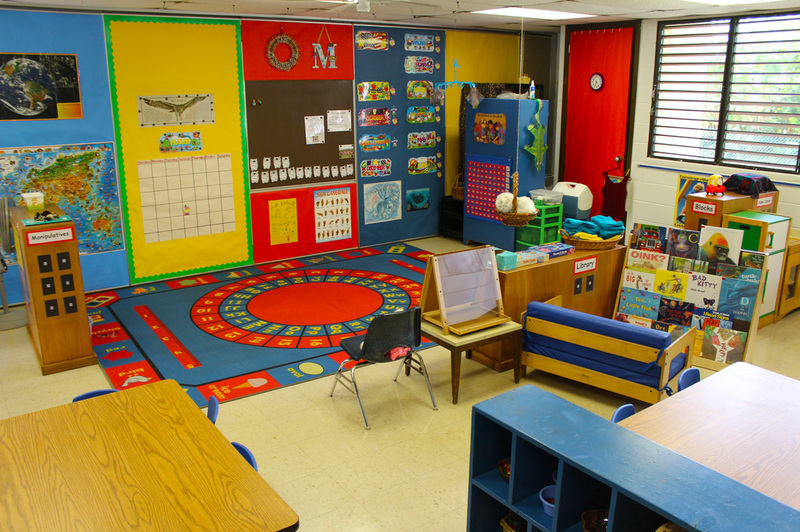 The tuition for the 2016-2017 school year is $6900. 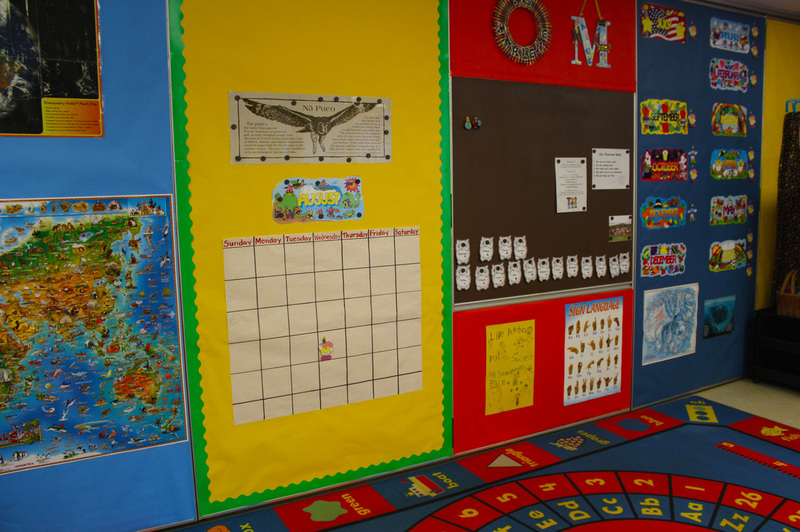 Please note the following childcare subsidy information: If parents work or attend school, you may qualify for a DHS (Dept. 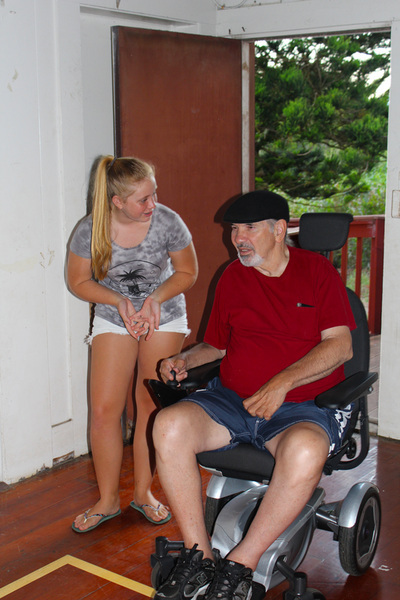 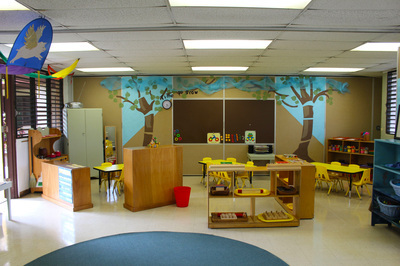 of Human Services) Child Care subsidy. Call the Arbor Childcare office at 245-2193 for information. 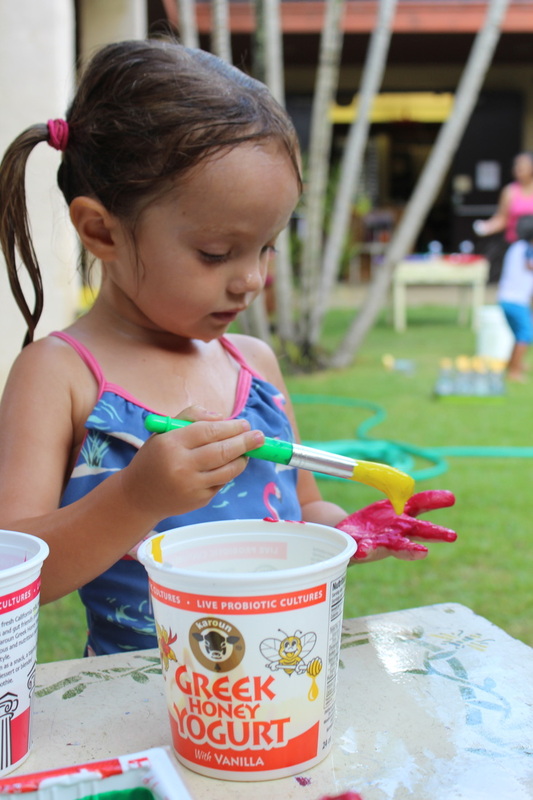 If your child is of Hawaiian ancestry, call Queen Liliuokalani Children’s Center at 245-1873 or Keiki O Ka’Aina at 808-845-3454 for information. 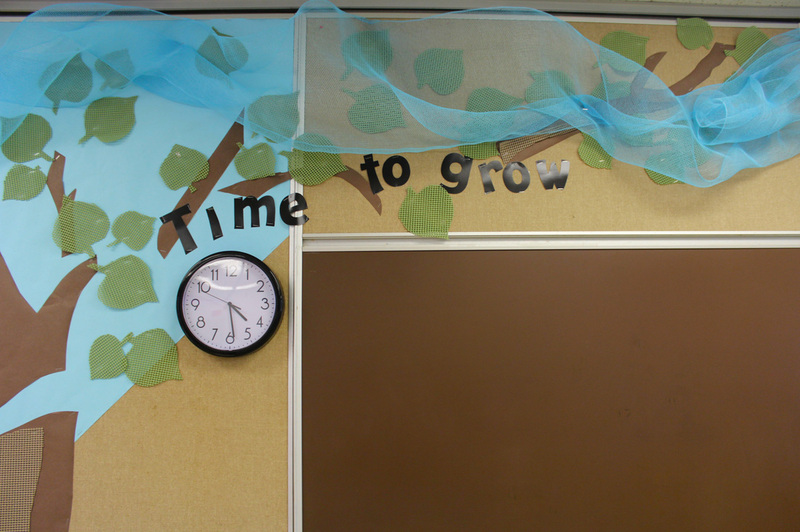 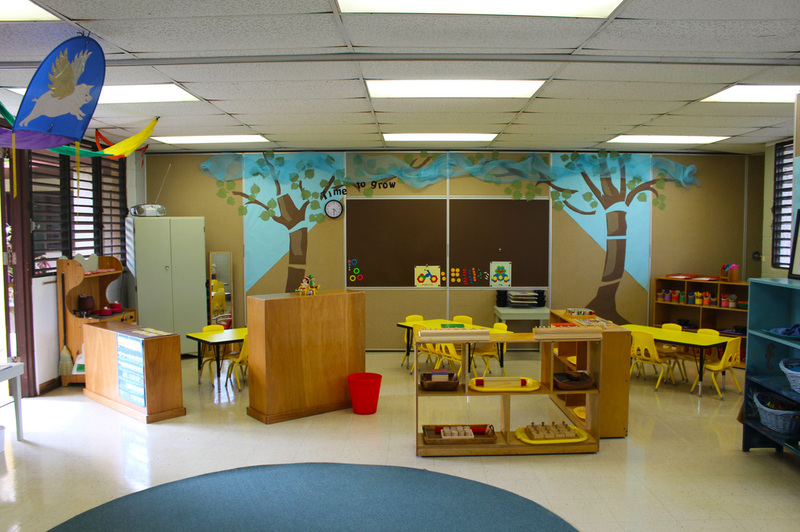 If your child is born between August 2011 and July 2012, you may also qualify for Preschool Open Doors. Please note Open Doors has a new enrollment period, February 1 - March 31 only. You can contact them at (800) 746-5620 or www.patchhawaii.org. 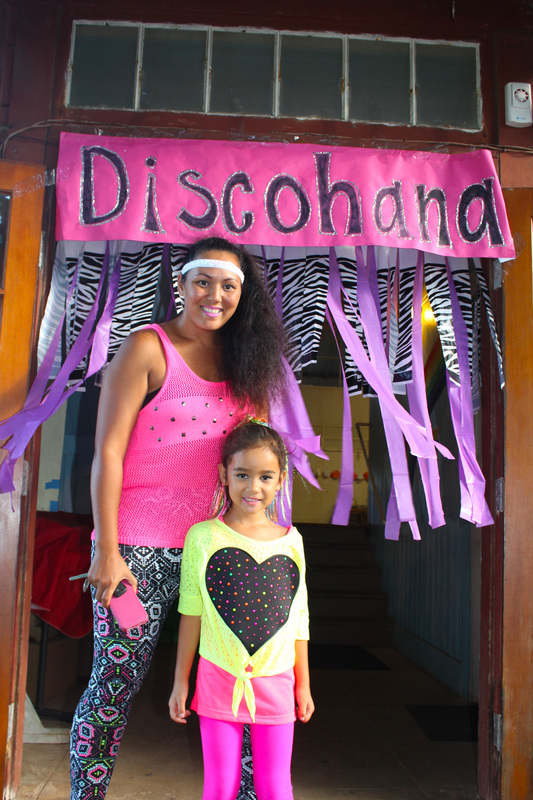 We are excited to introduce our school ‘Ohana to you and we hope that you will find us to be a good match for your child. 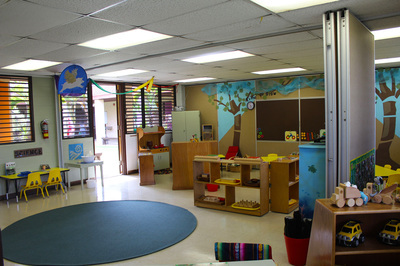 Please do not hesitate to contact us if we can answer any questions and/or to arrange a tour of our campus. 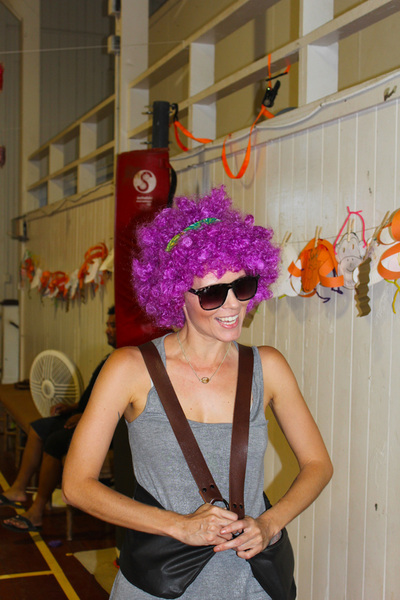 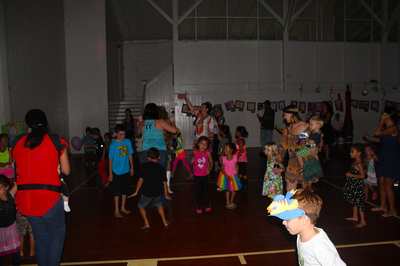 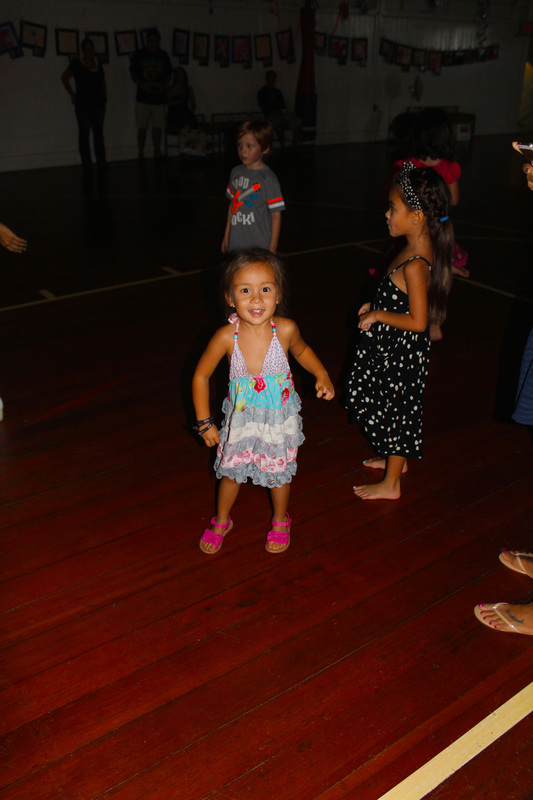 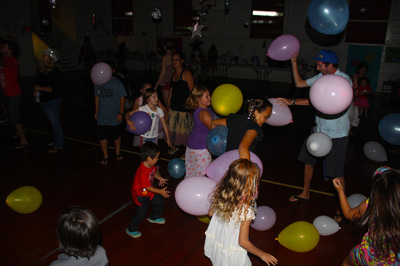 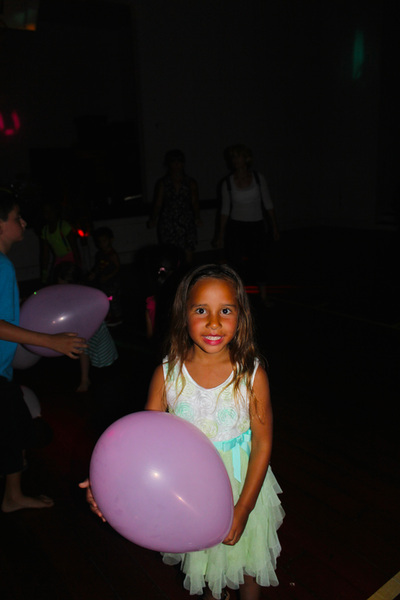 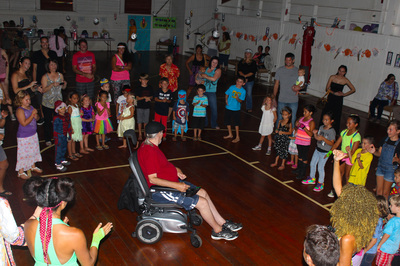 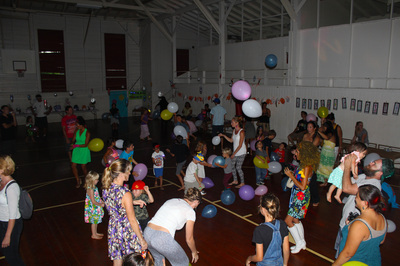 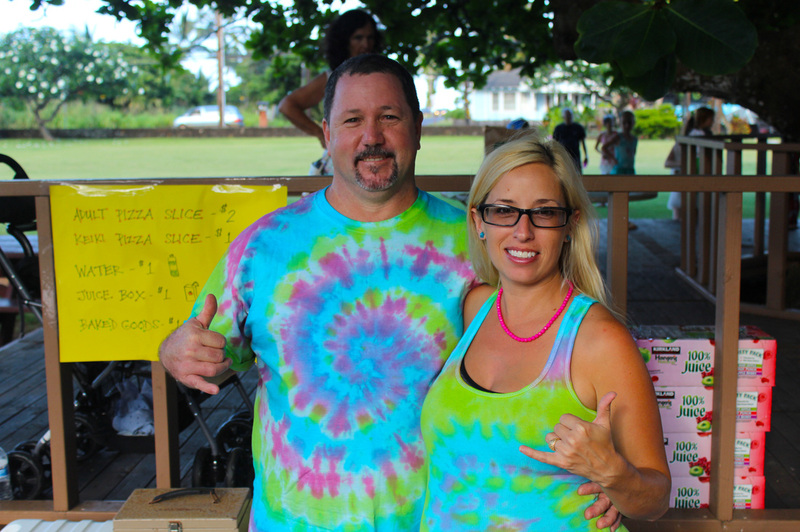 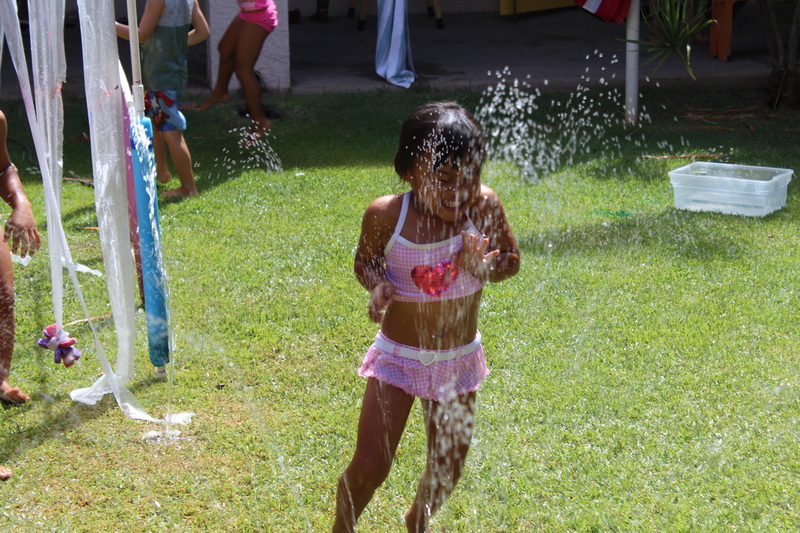 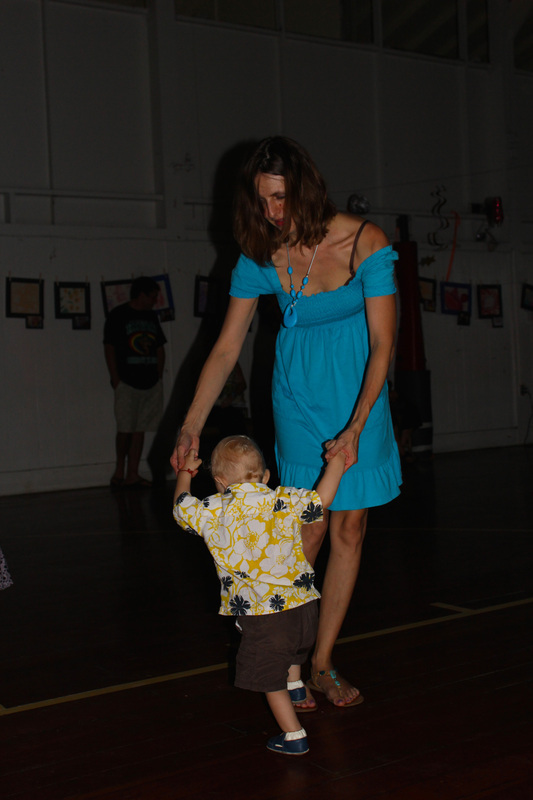 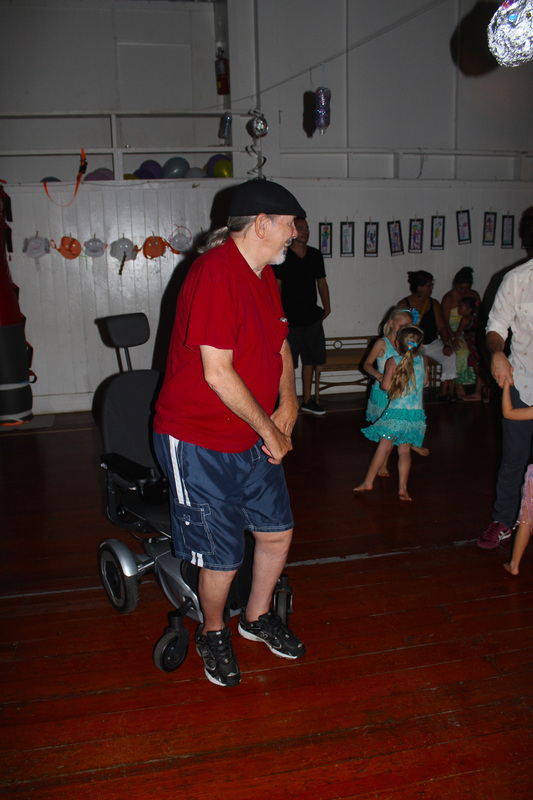 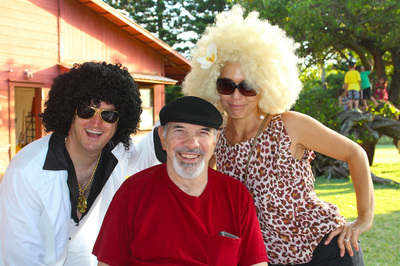 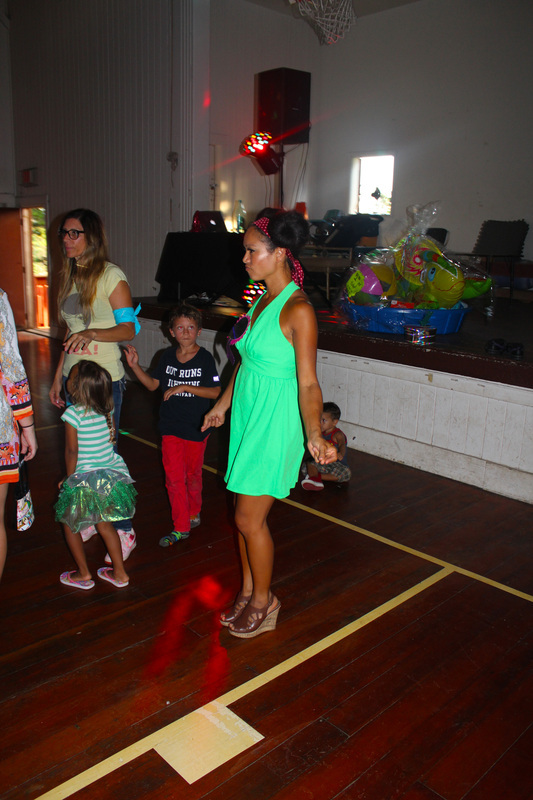 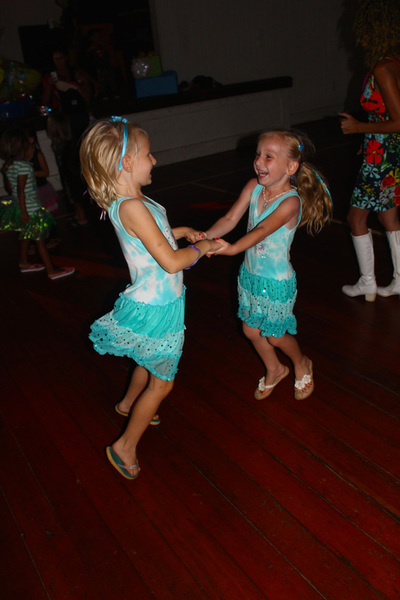 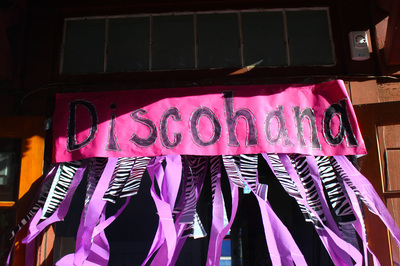 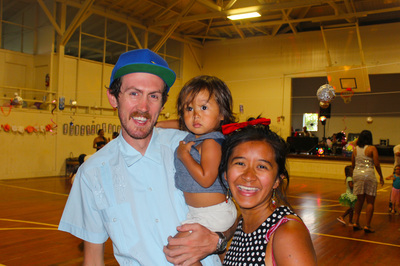 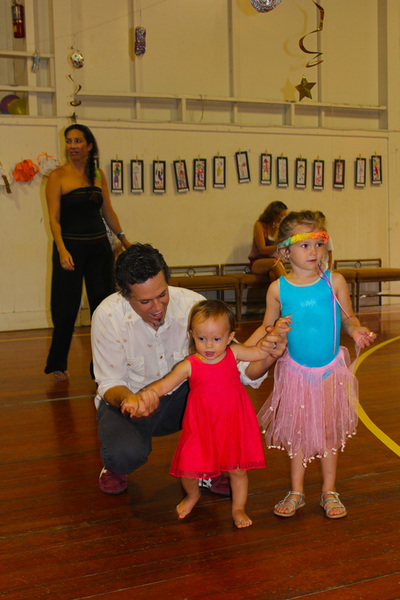 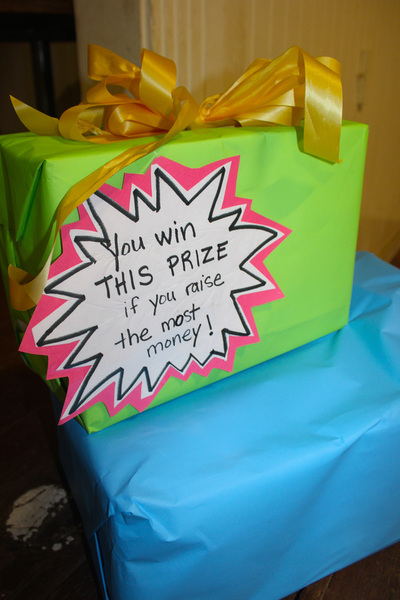 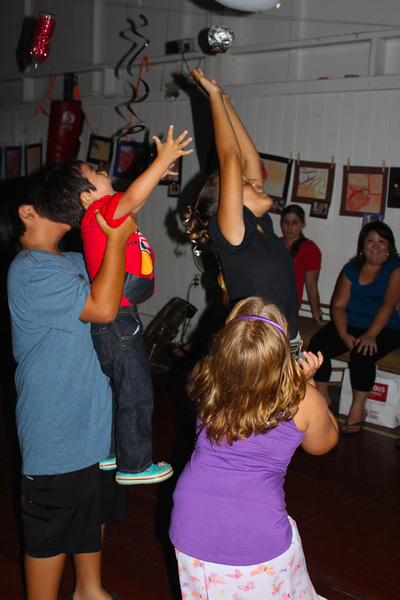 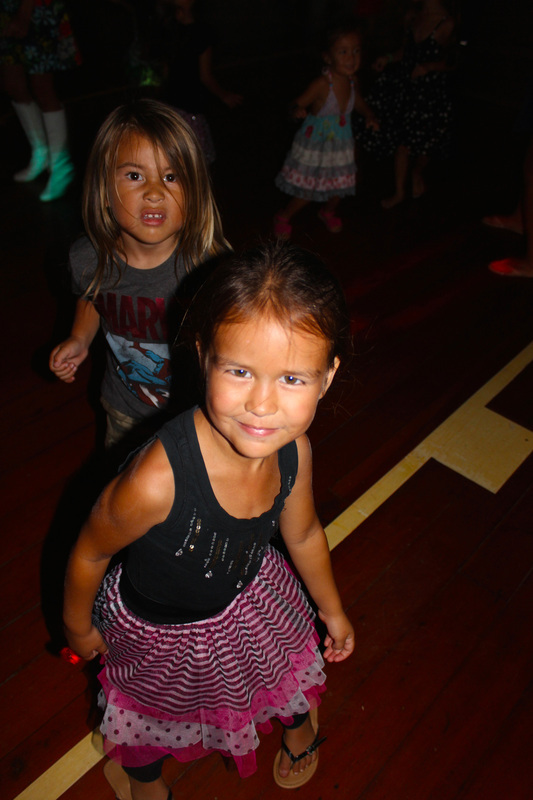 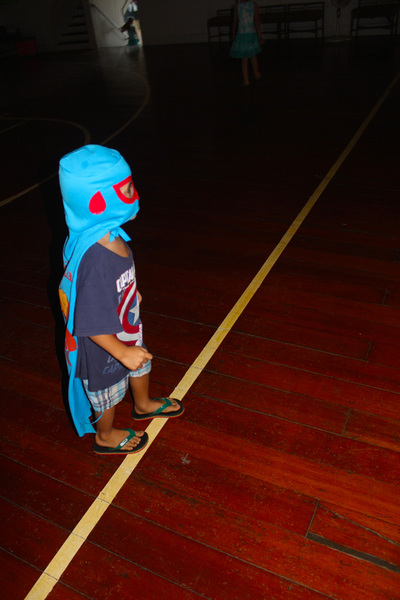 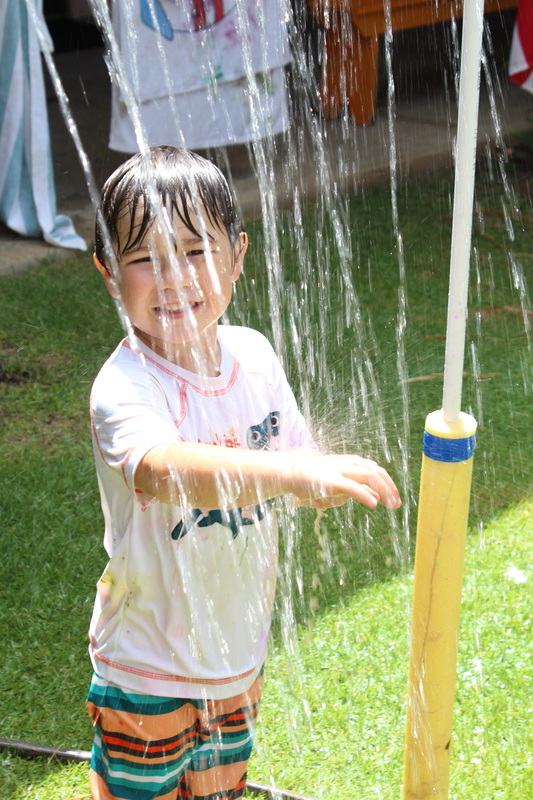 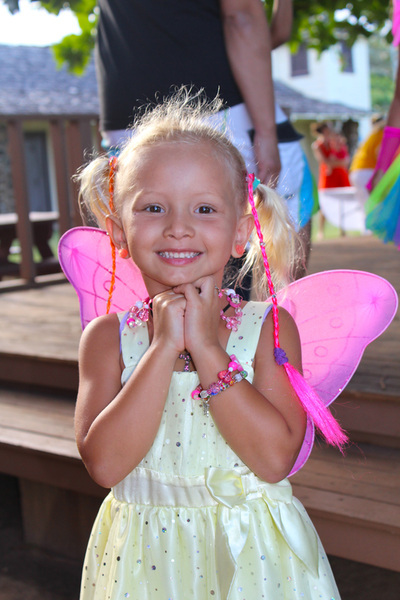 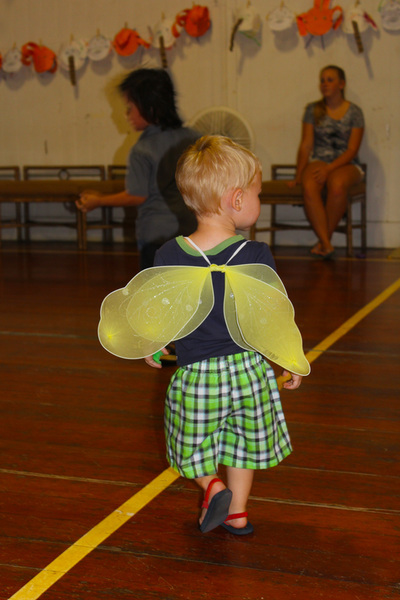 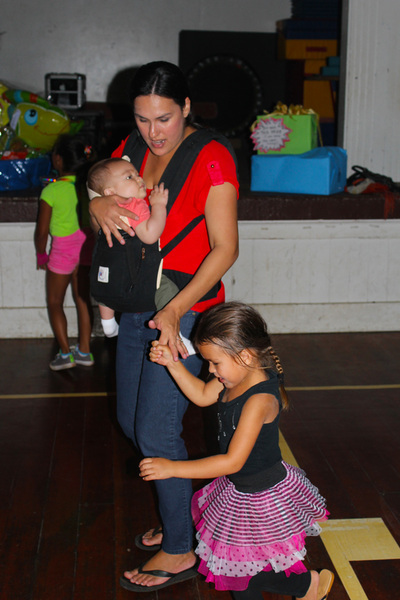 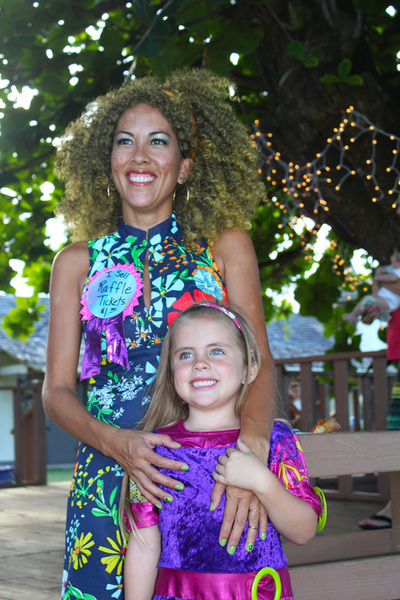 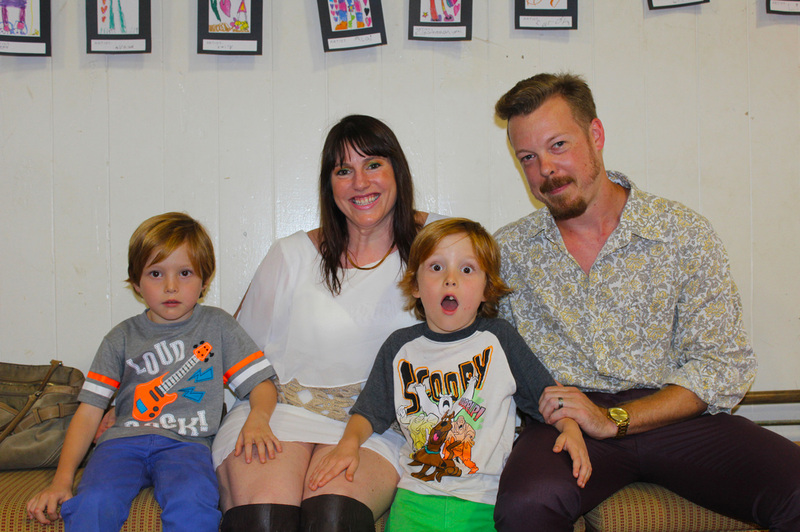 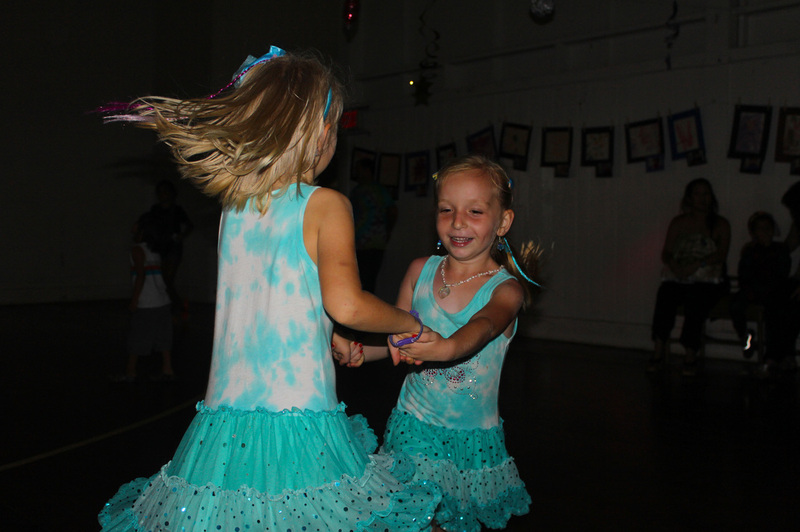 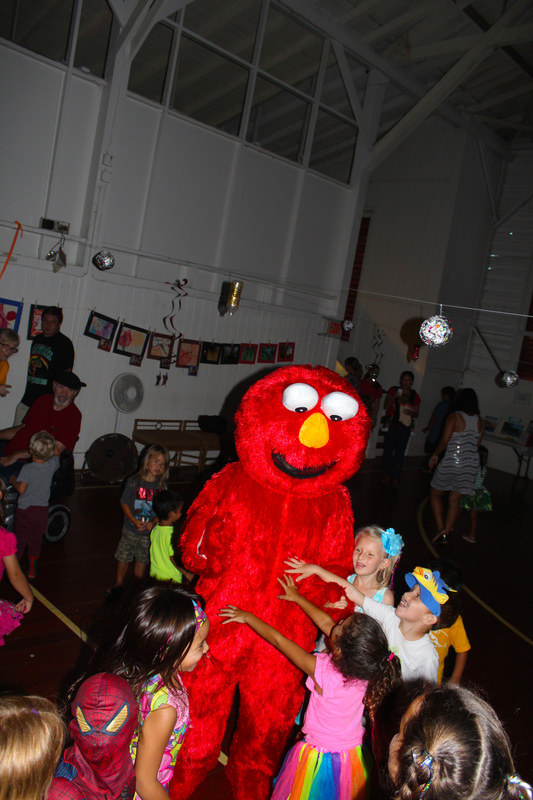 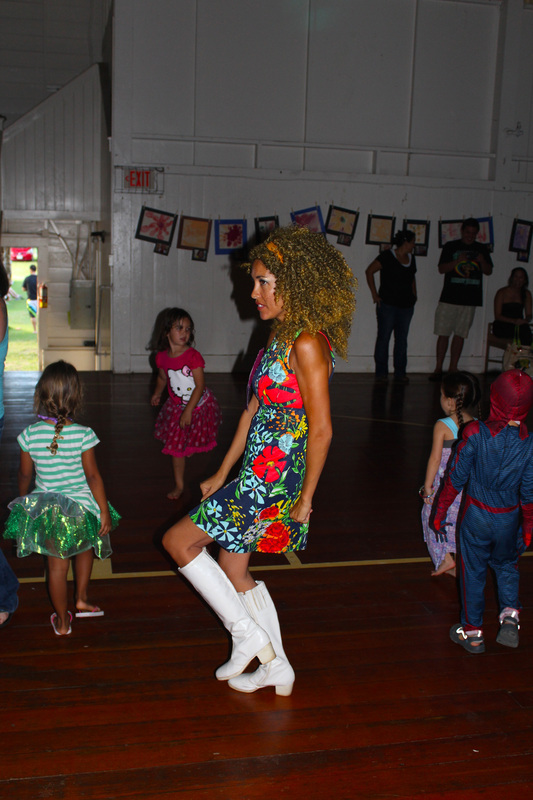 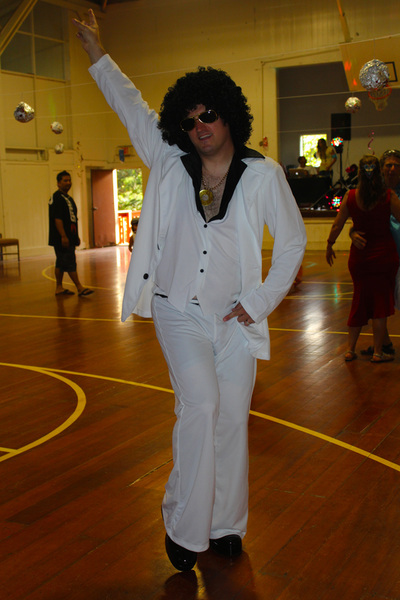 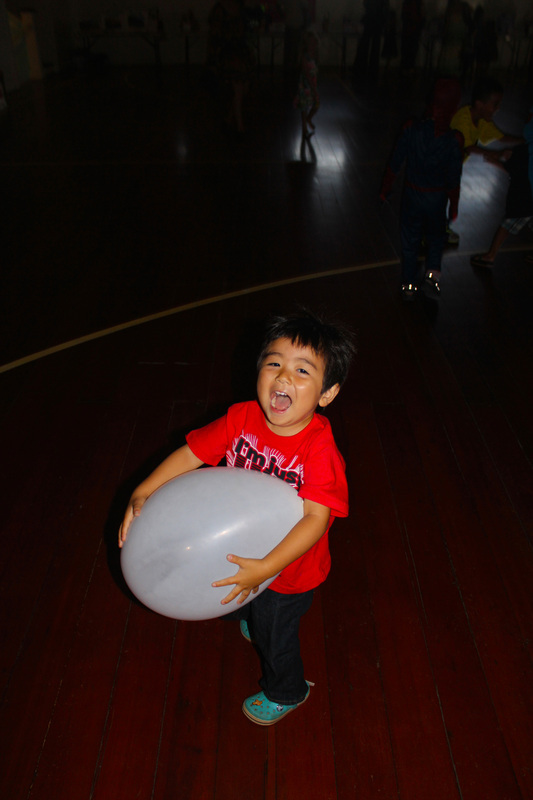 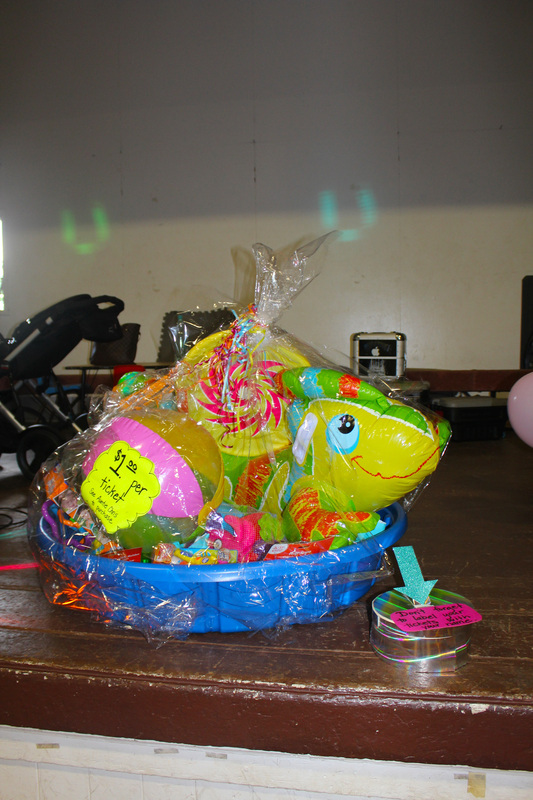 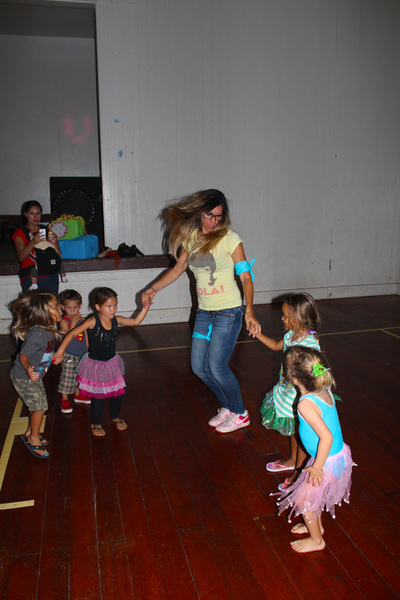 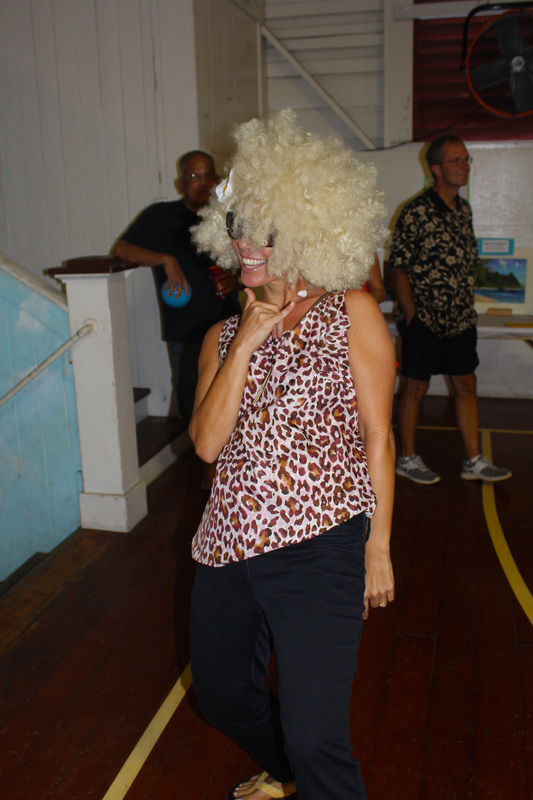 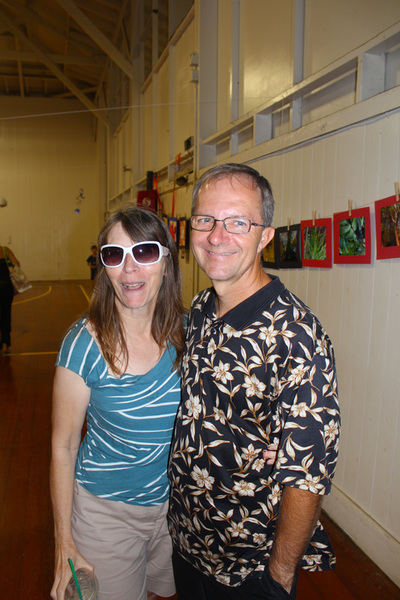 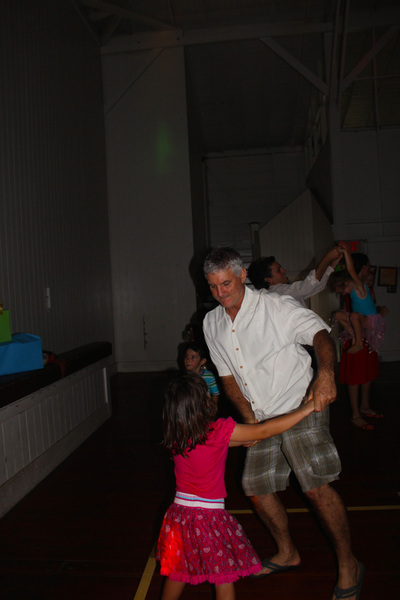 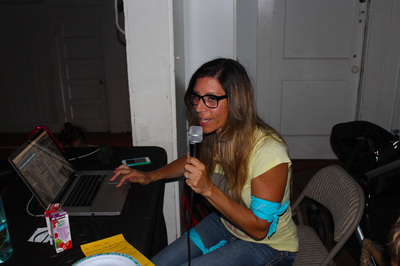 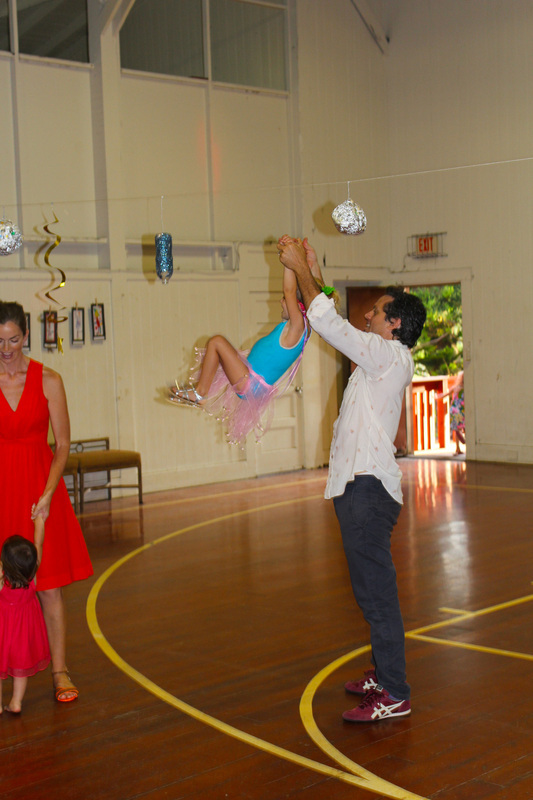 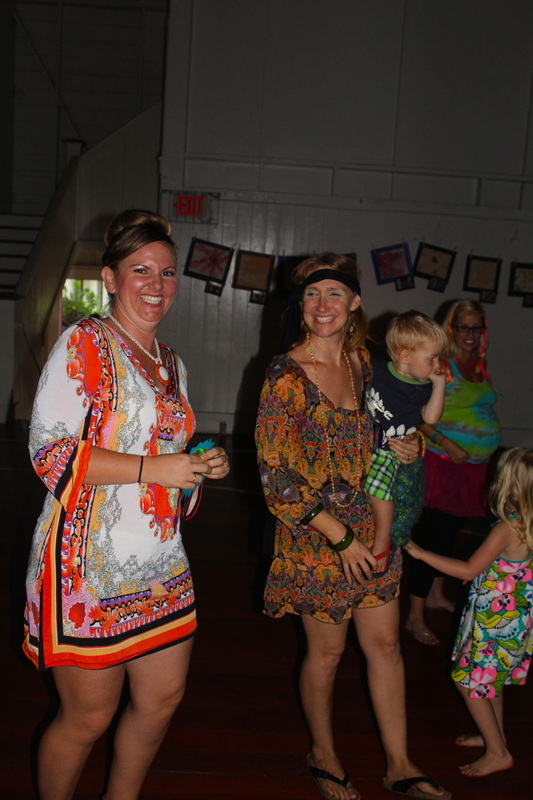 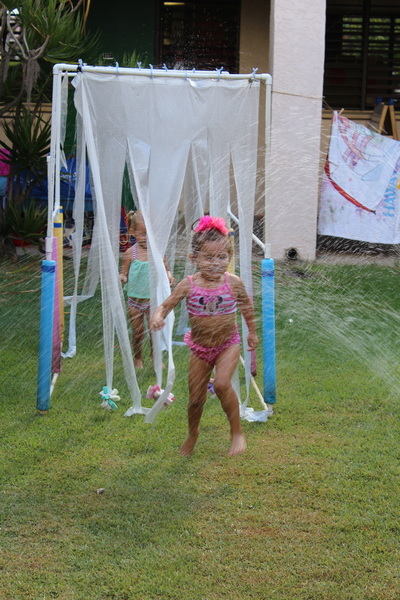 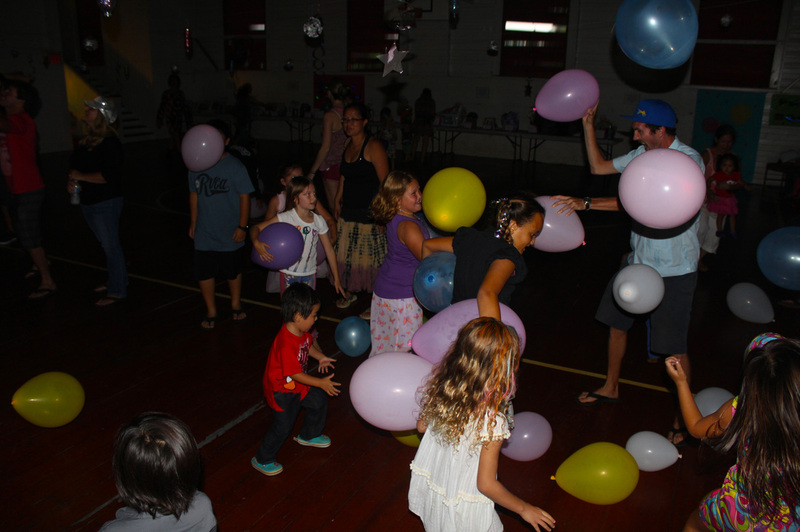 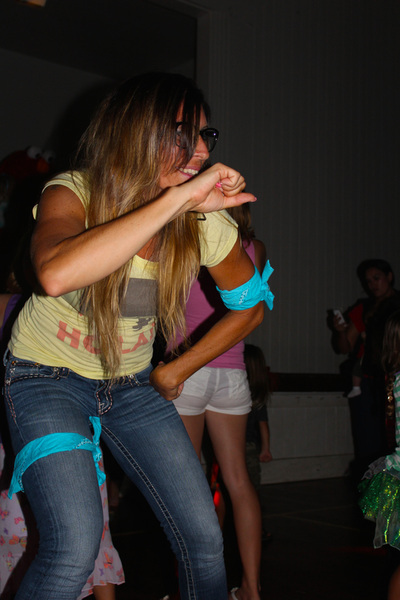 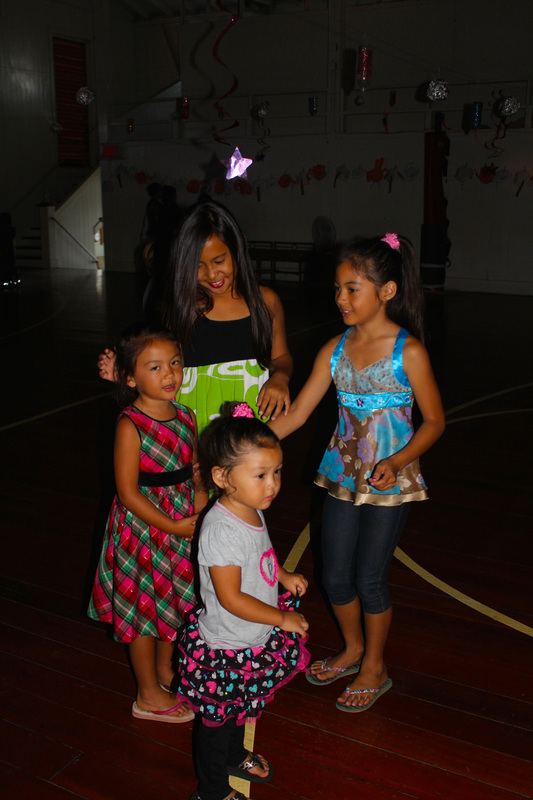 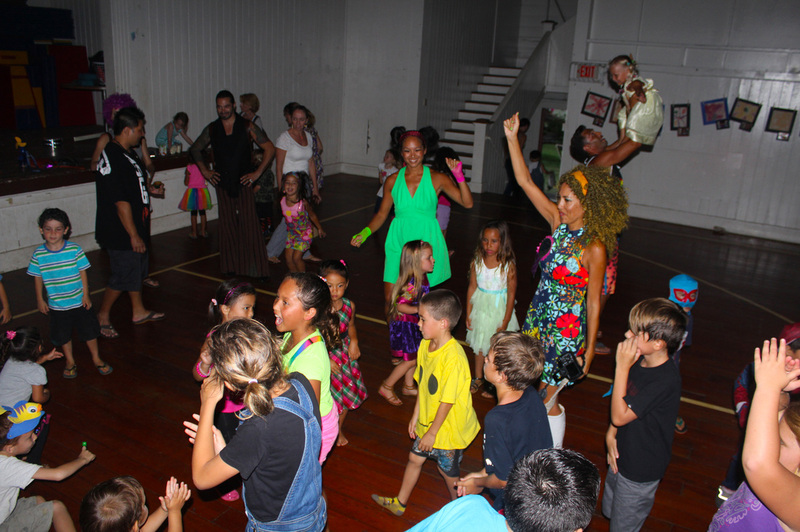 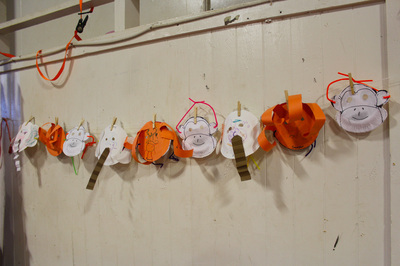 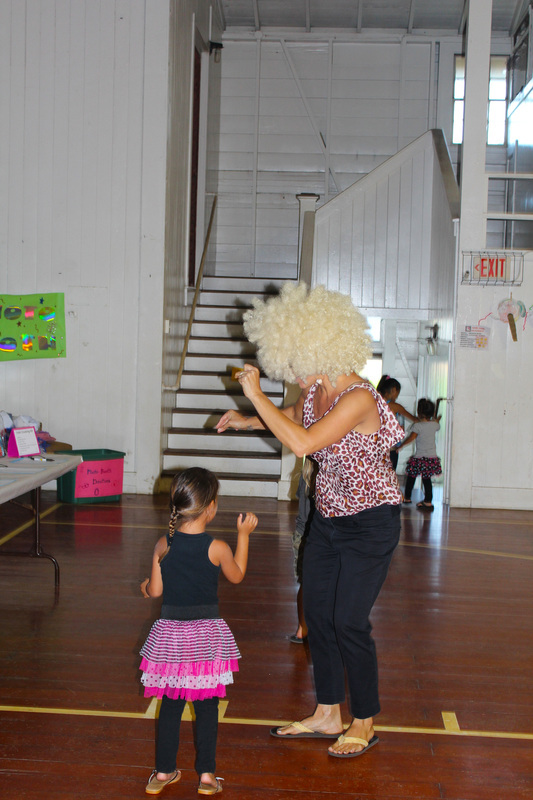 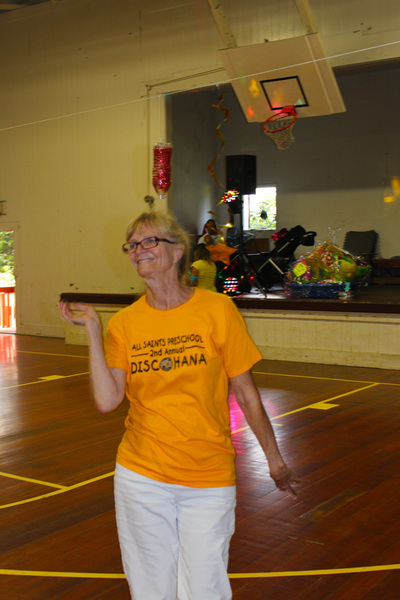 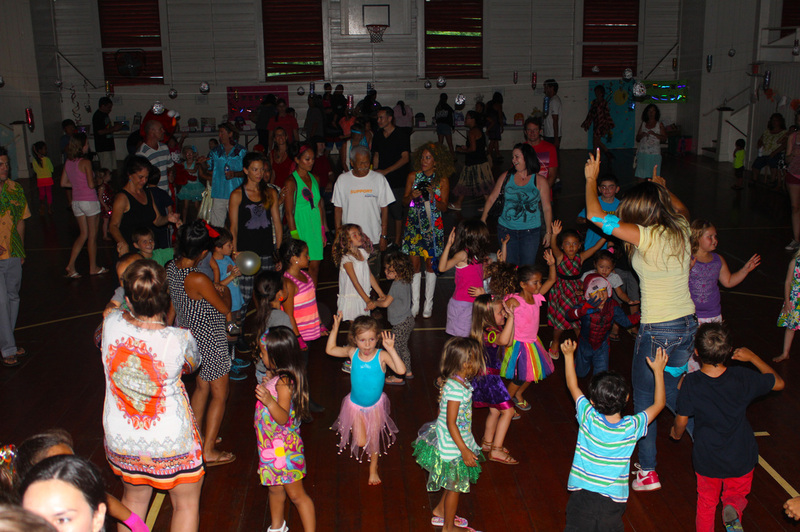 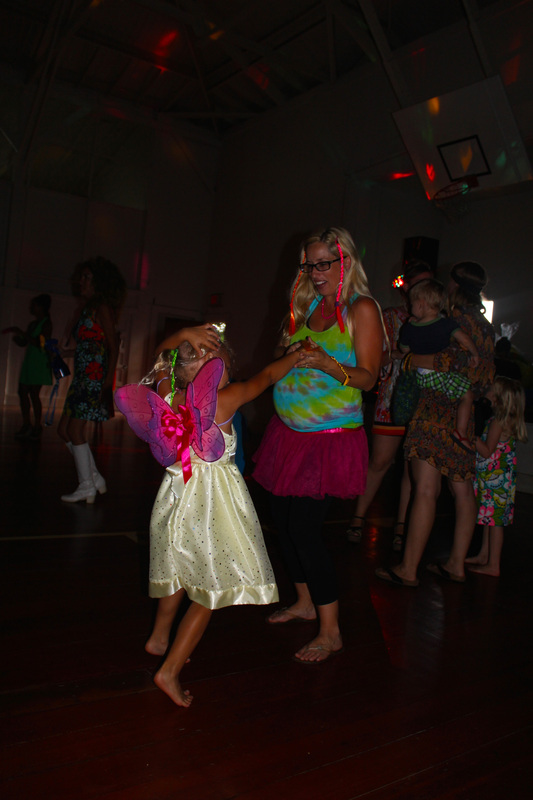 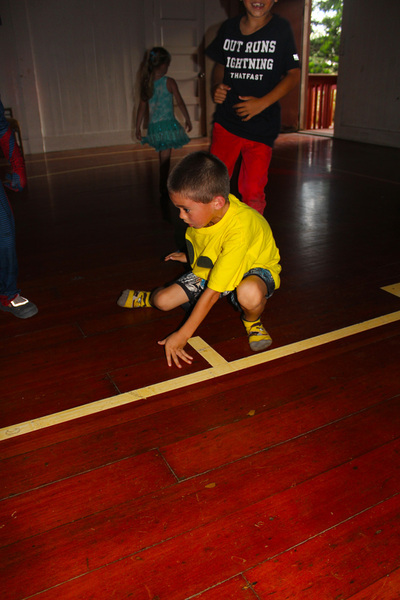 With Labor Day weekend coming, it was time for the All Saints' Preschool "End of Summer Bash." The morning consisted of lots of water! 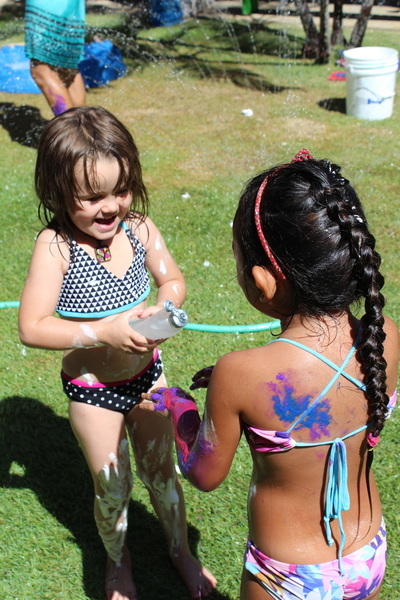 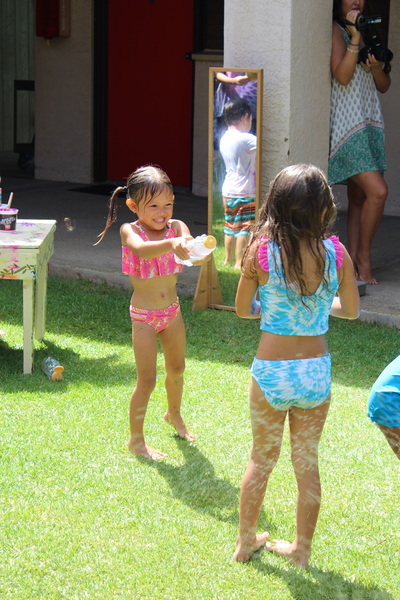 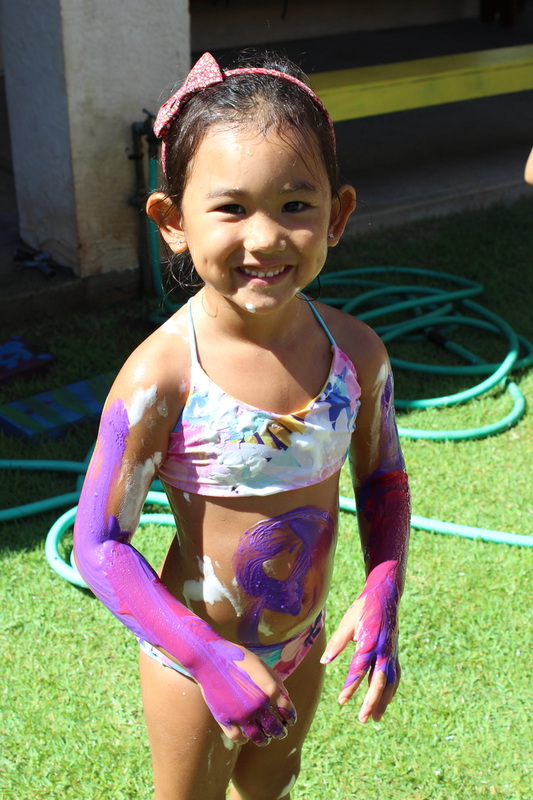 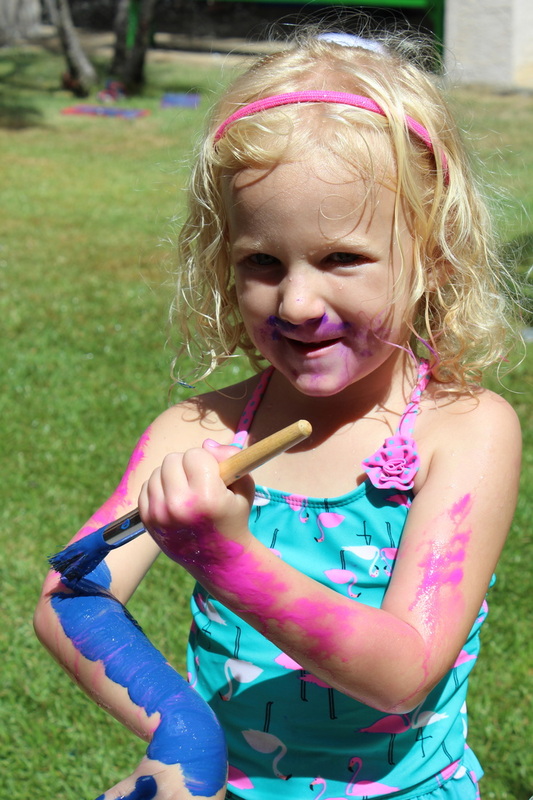 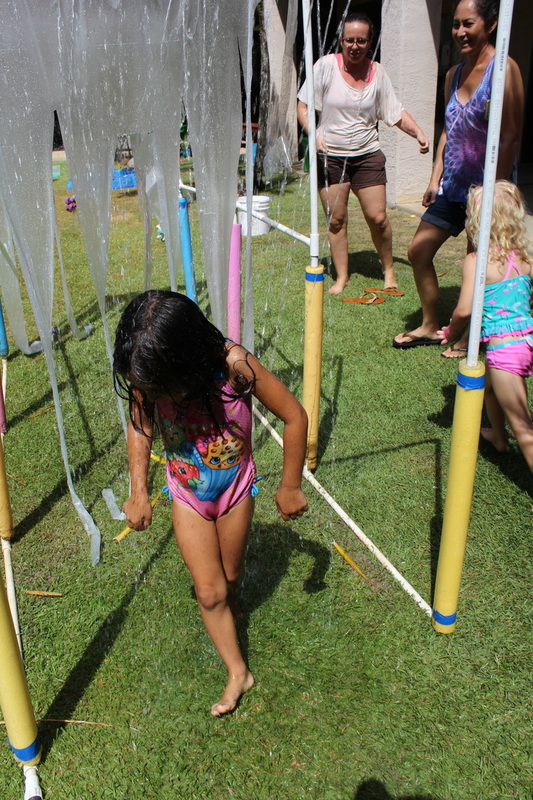 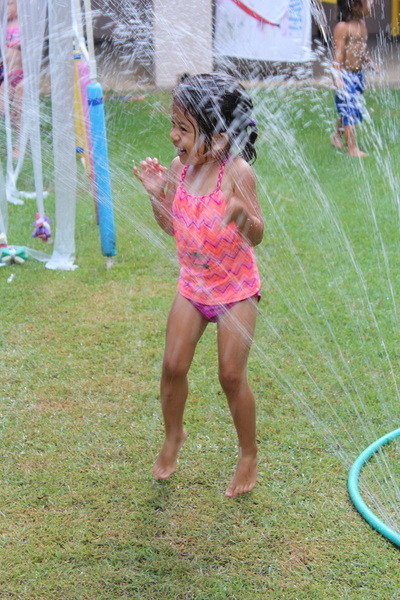 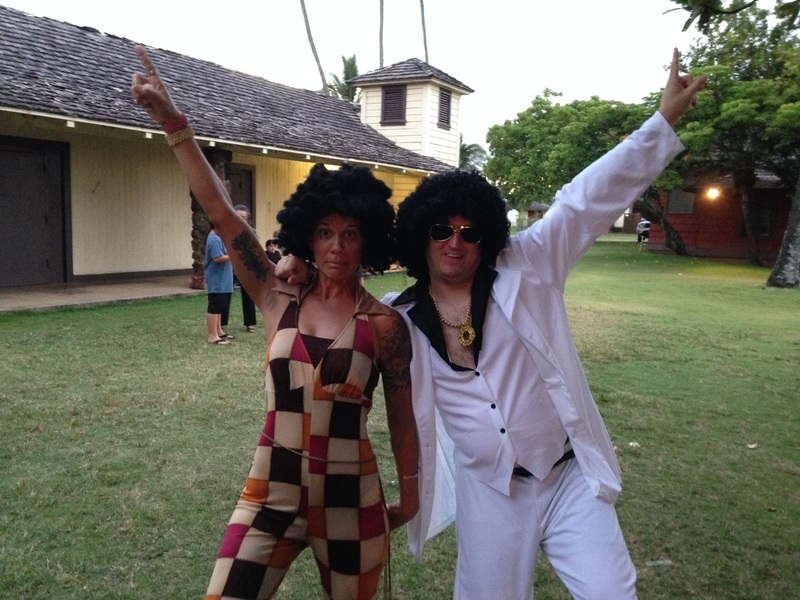 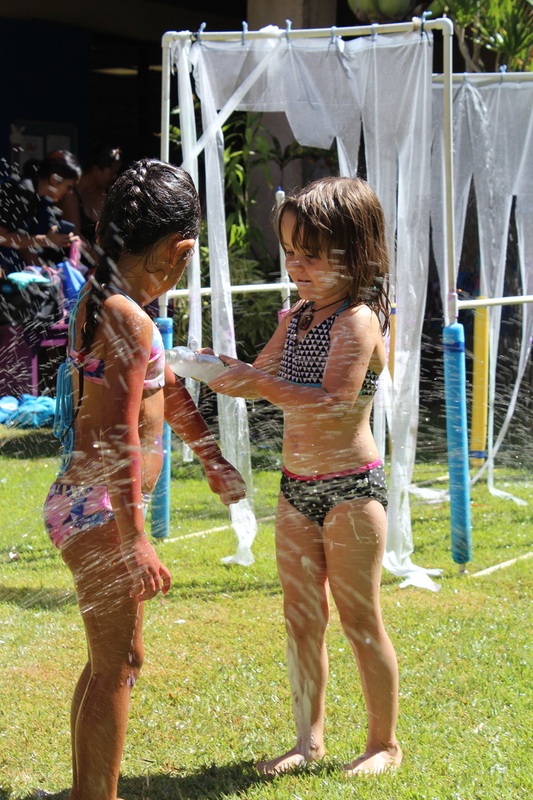 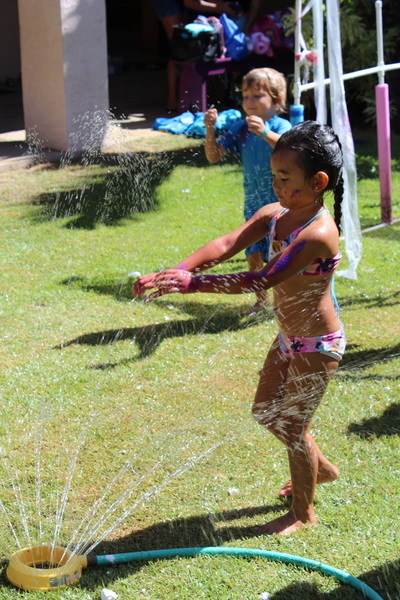 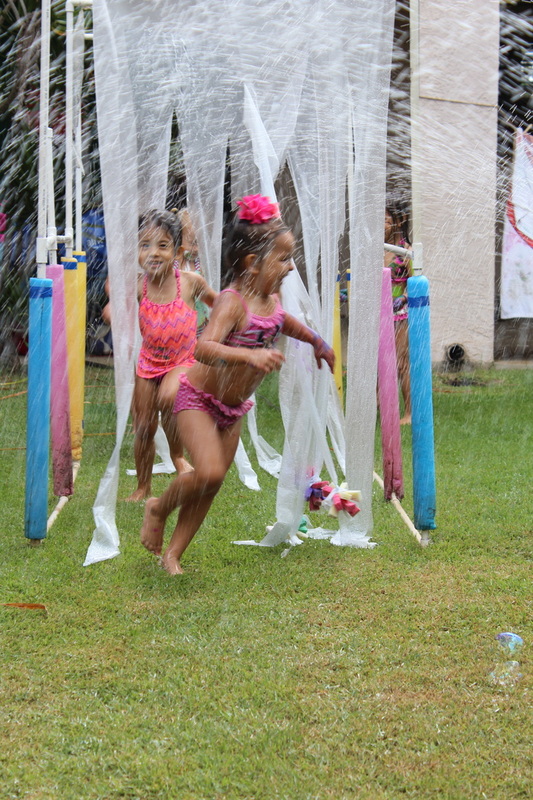 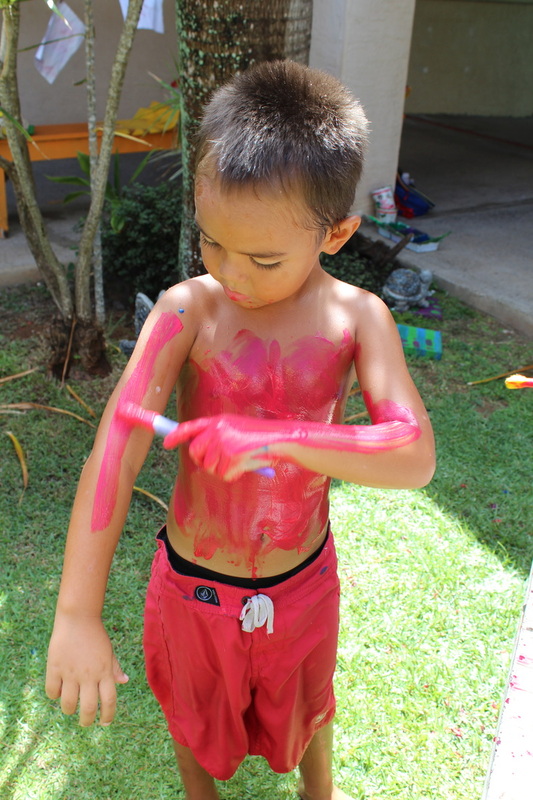 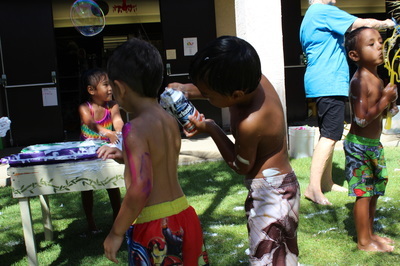 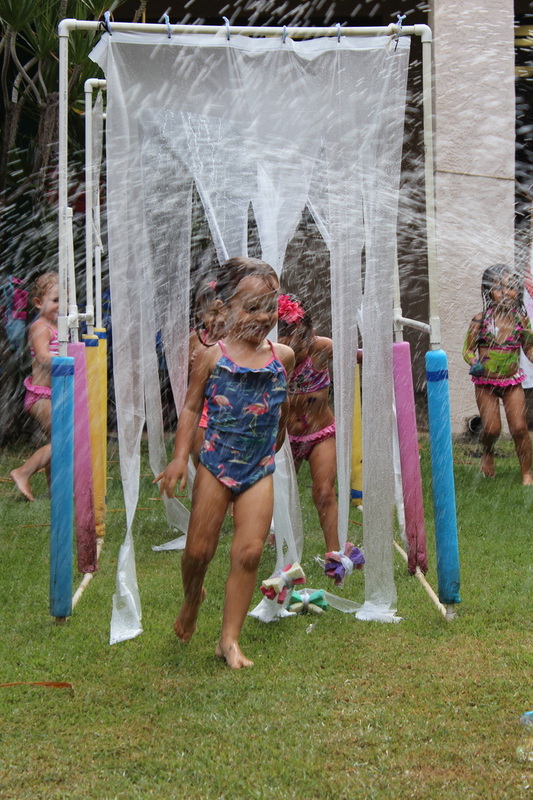 Plus there were plenty of other surprises; body paint, shaving creams, wading pool, bubbles, colorful corn starch, and more. Check out the pictures of the event. 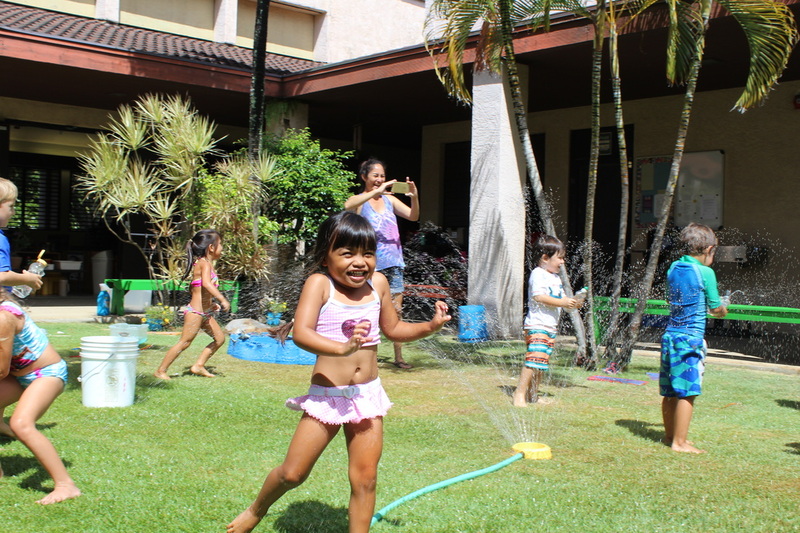 On Tuesday, August 4, students and staff returned from summer break for the first official day of the 2015-2016 school year. 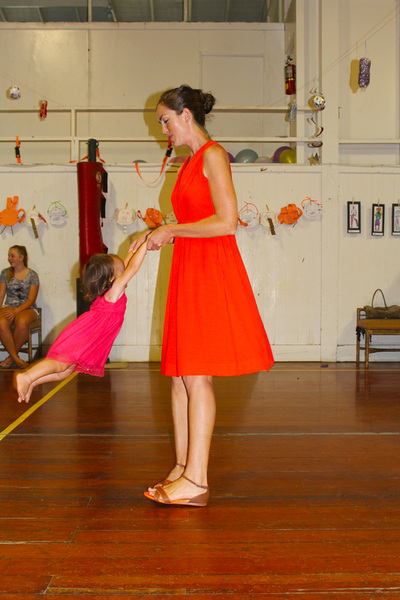 Students were joined by their parents/guardians to meet their teachers and begin exploring their new classrooms and the playground. 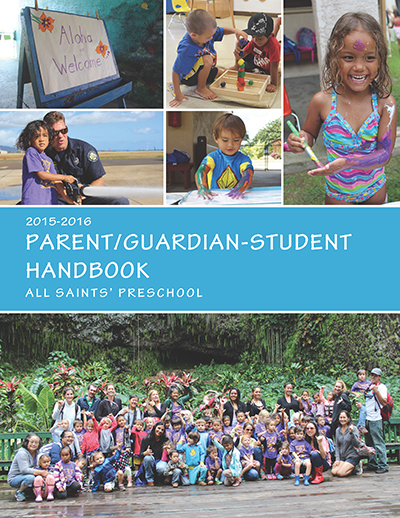 This summer, All Saints' Preschool completely redesigned and updated its Parent/Guardian-Student Handbook.To download, please click on the image to the right. The file is large (14MB). It might take a few minutes to download. 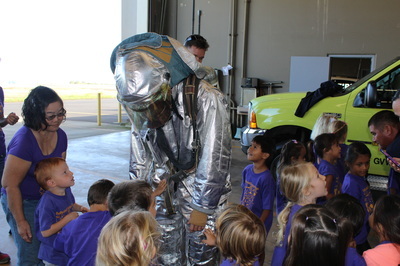 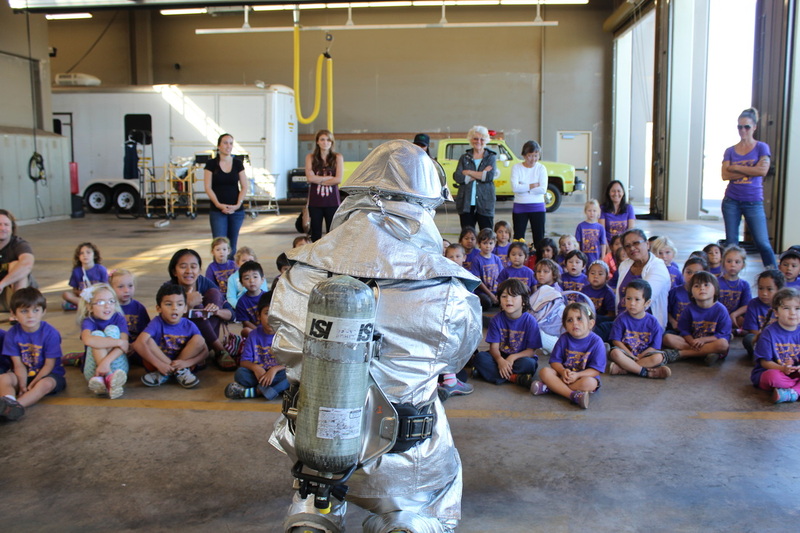 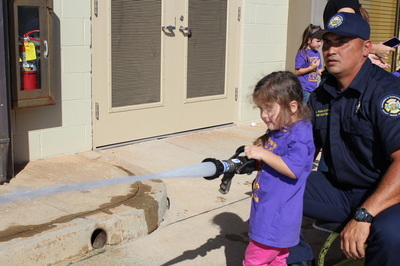 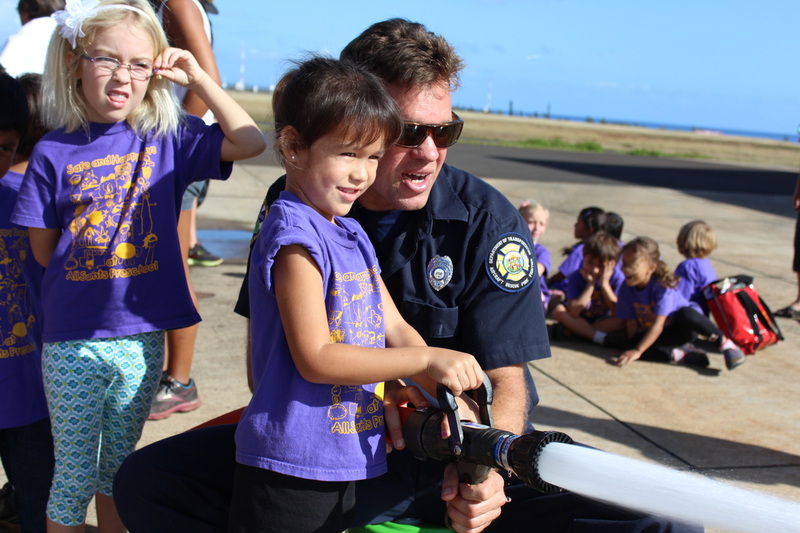 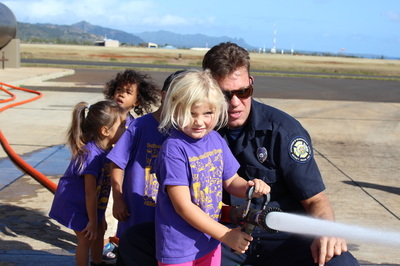 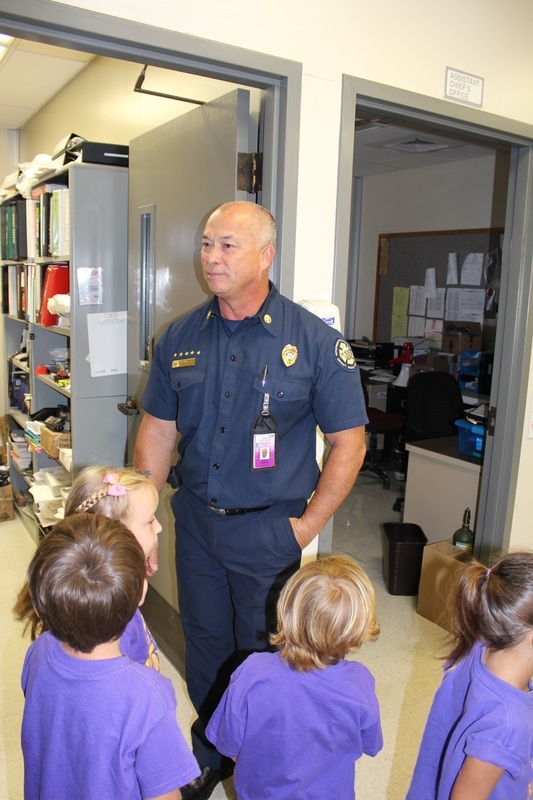 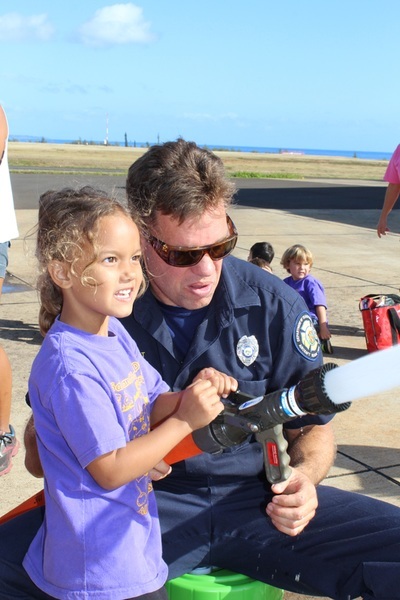 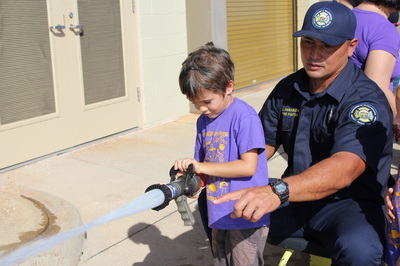 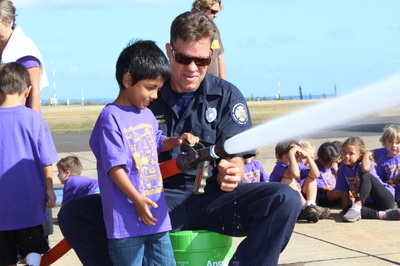 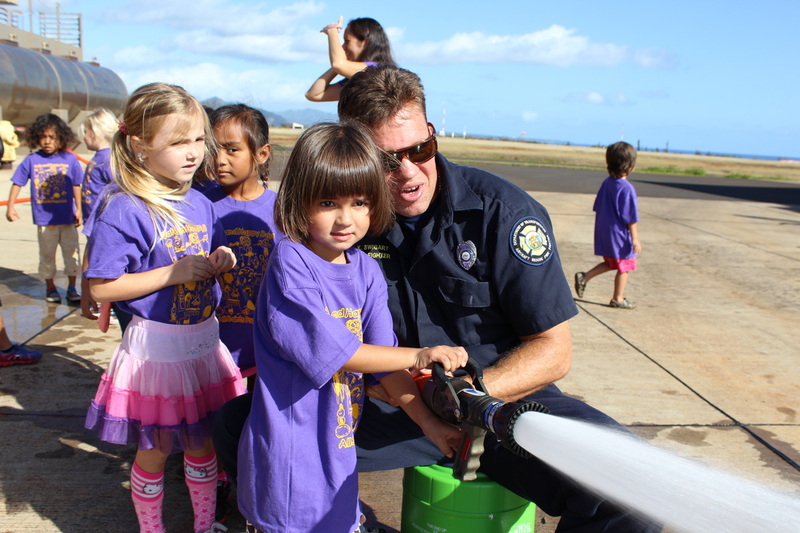 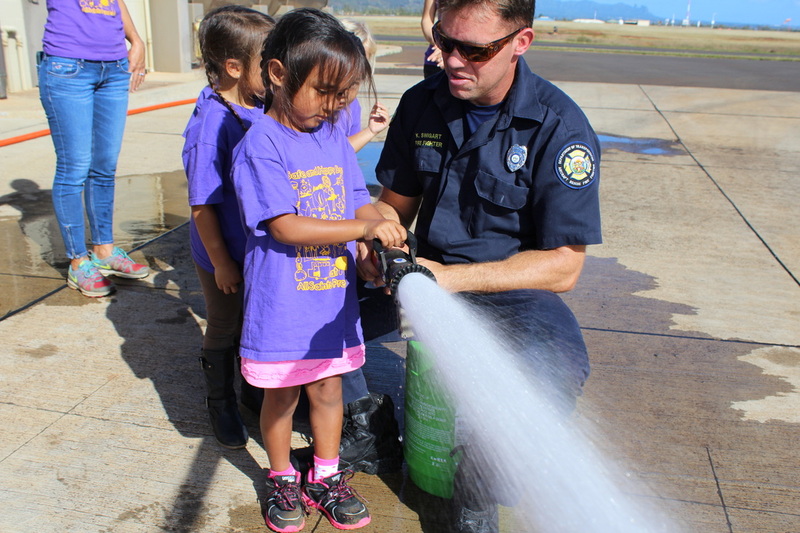 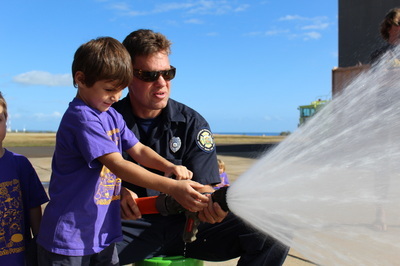 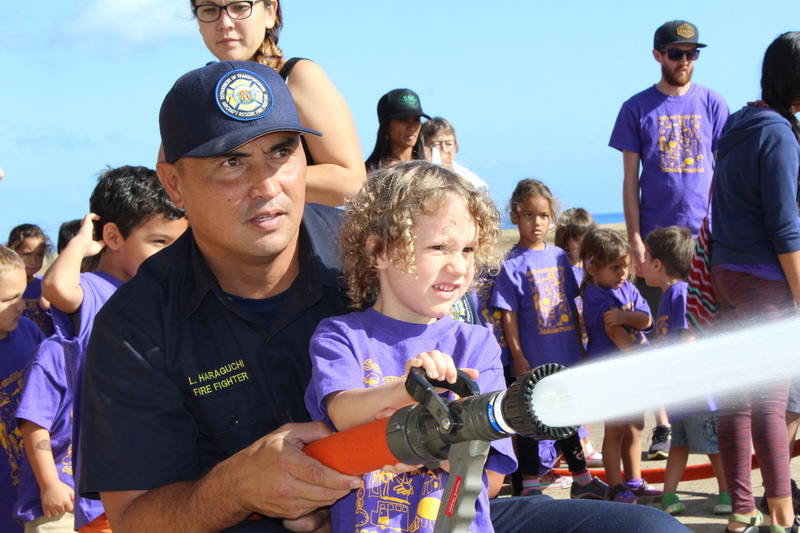 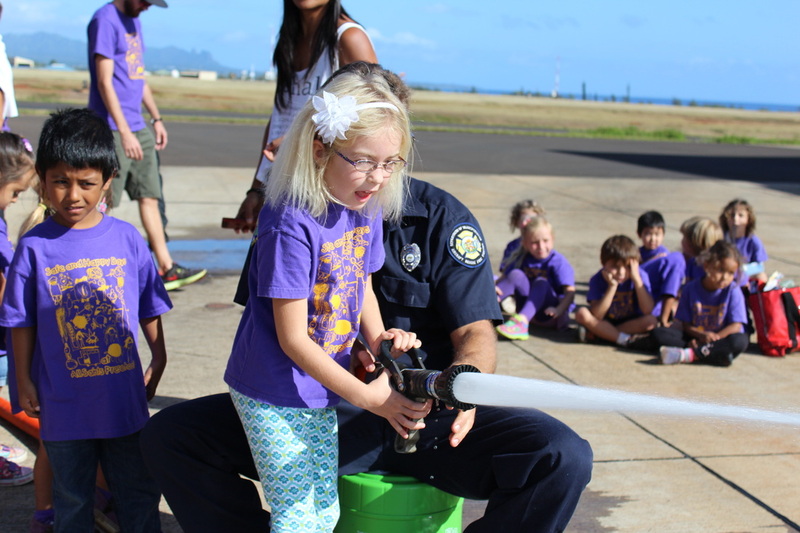 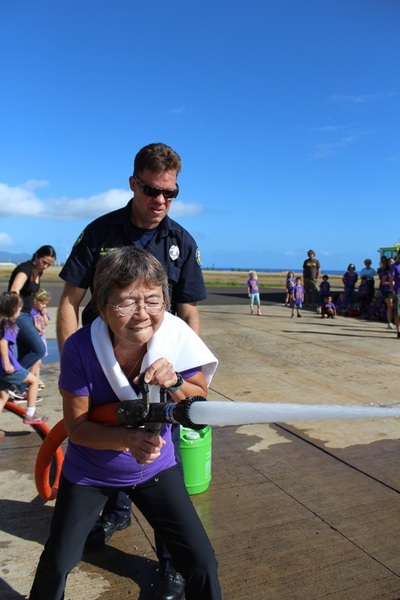 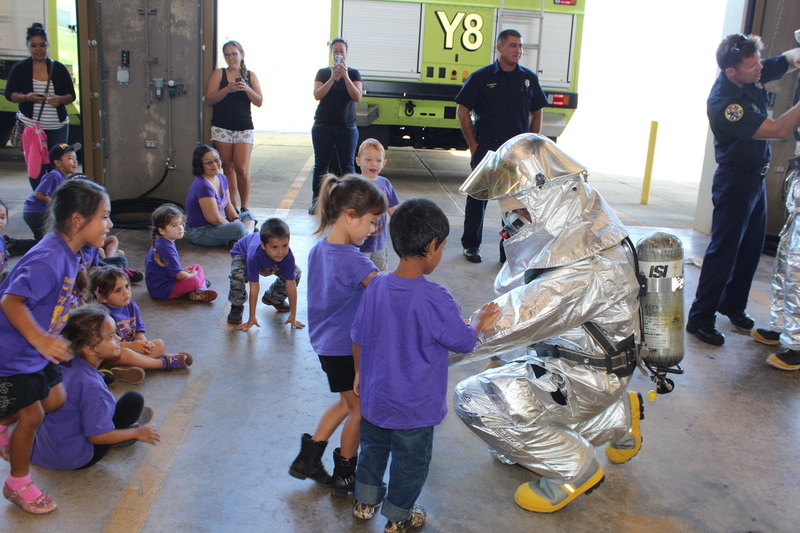 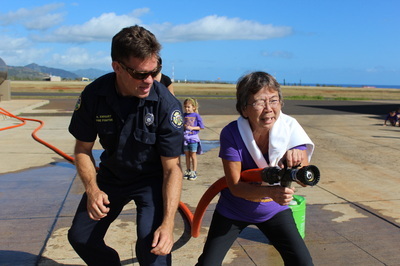 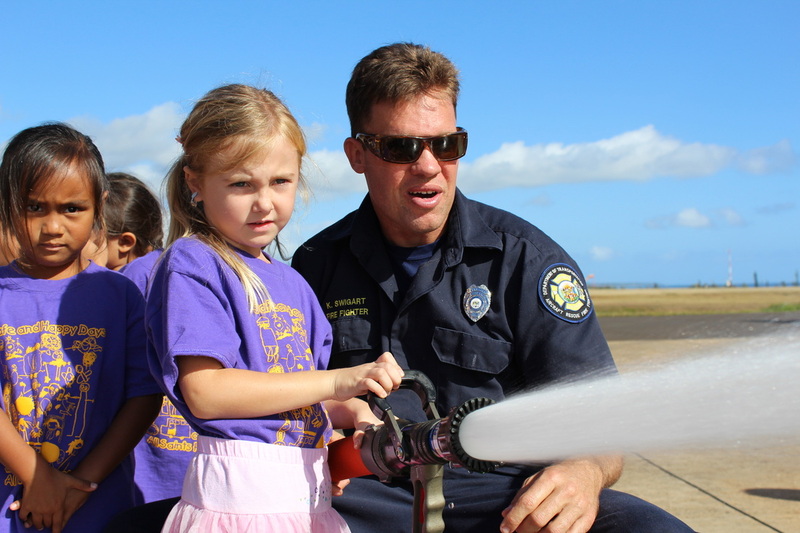 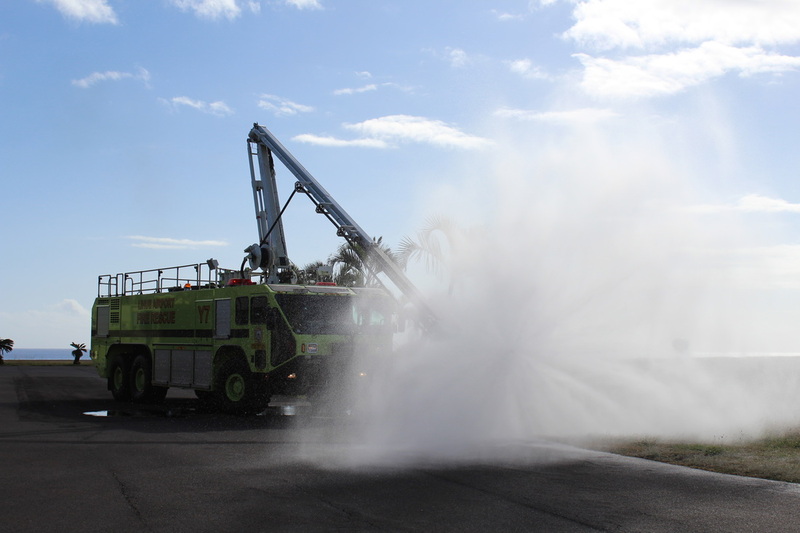 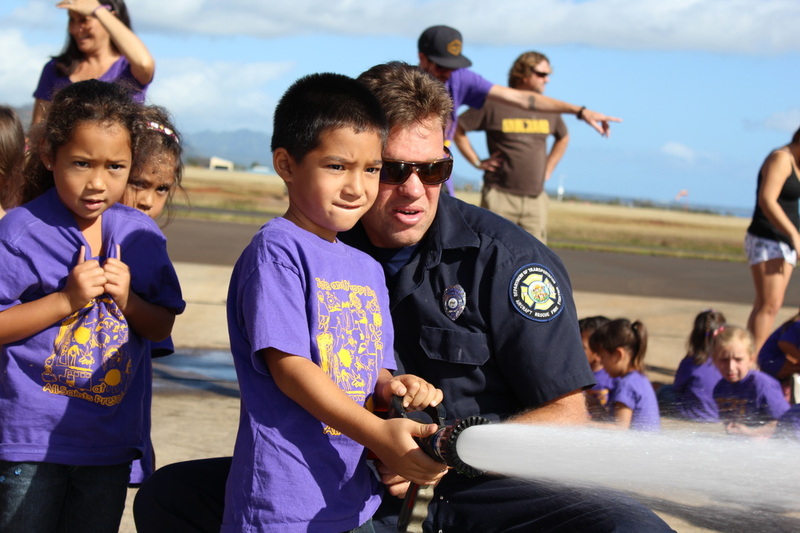 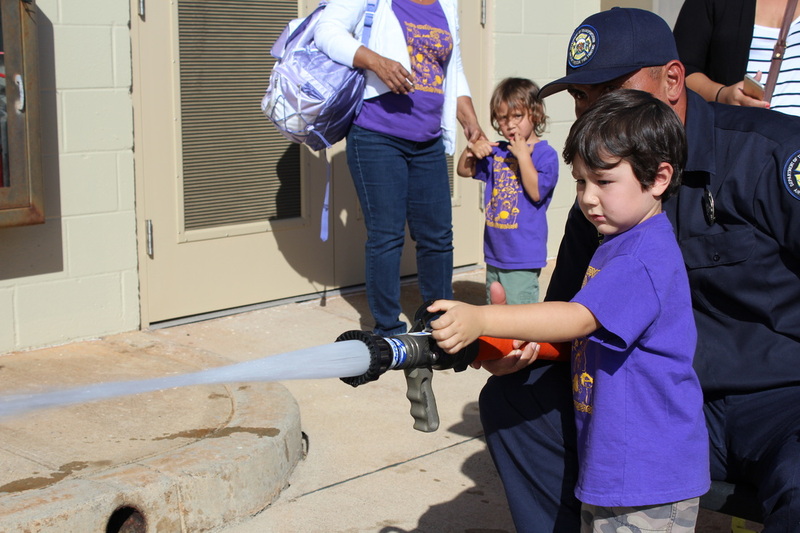 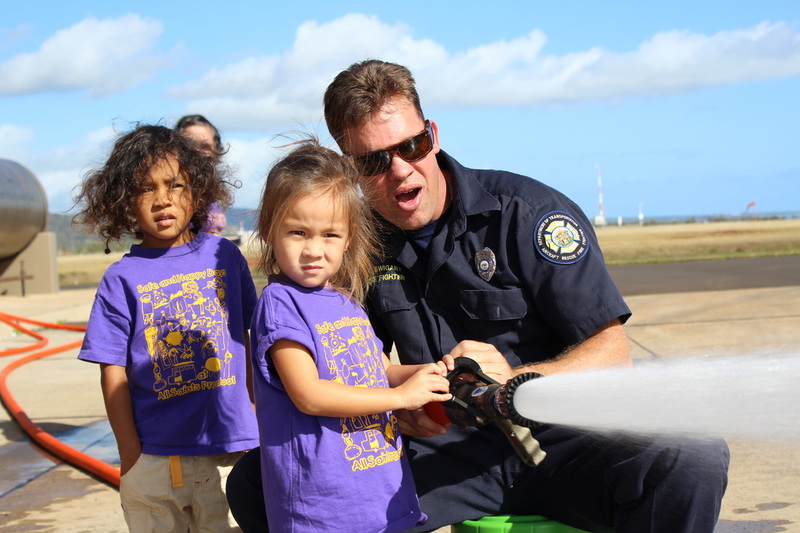 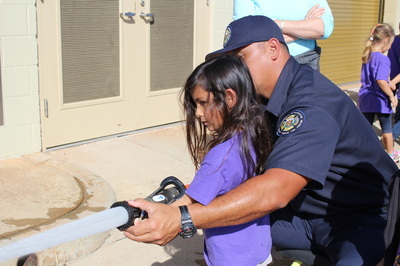 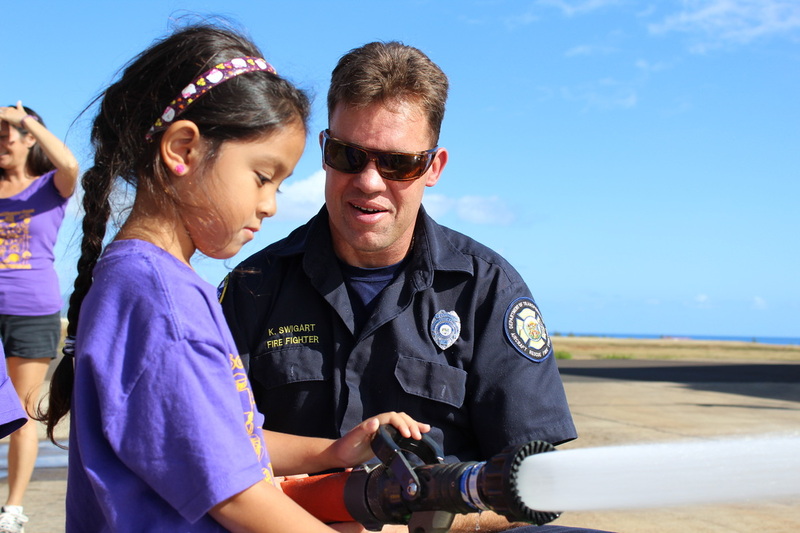 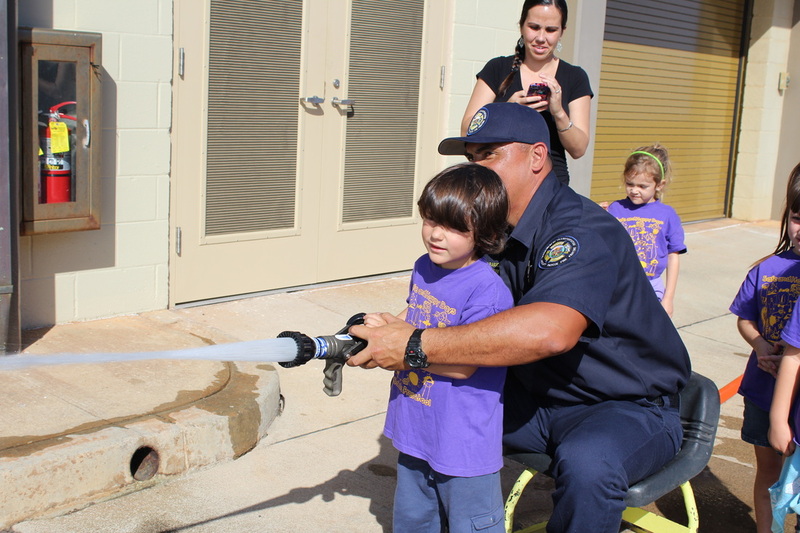 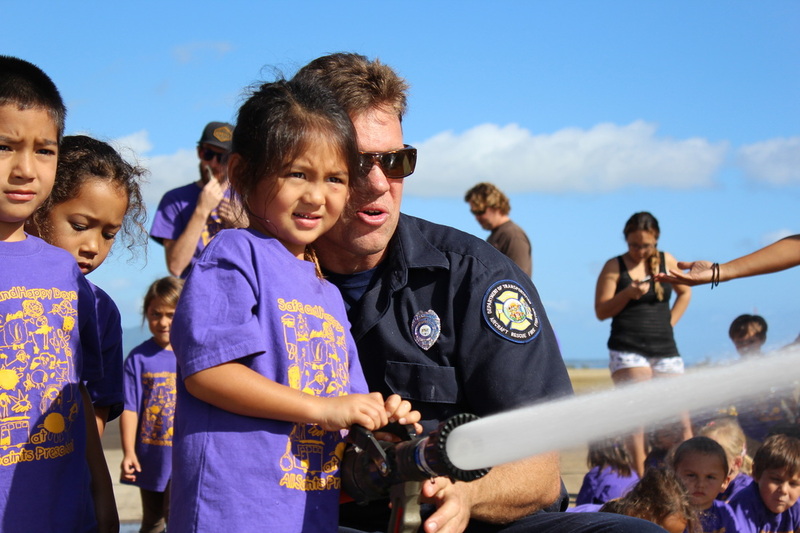 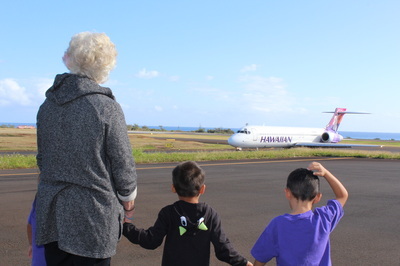 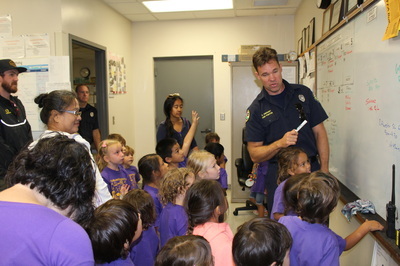 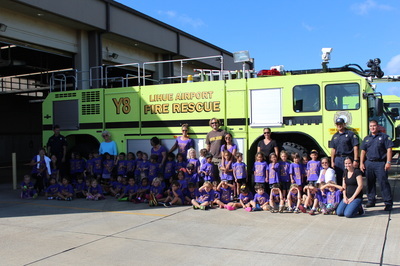 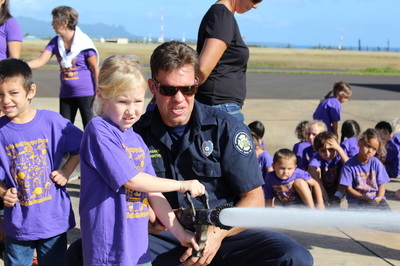 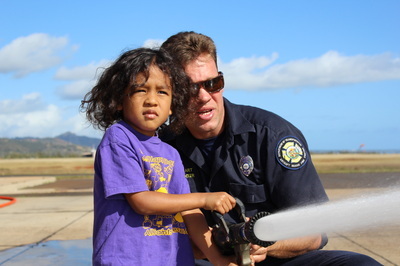 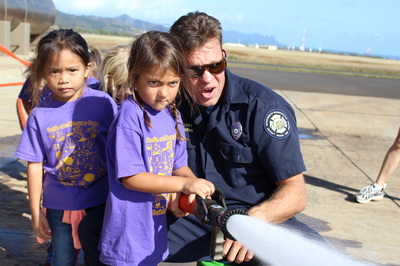 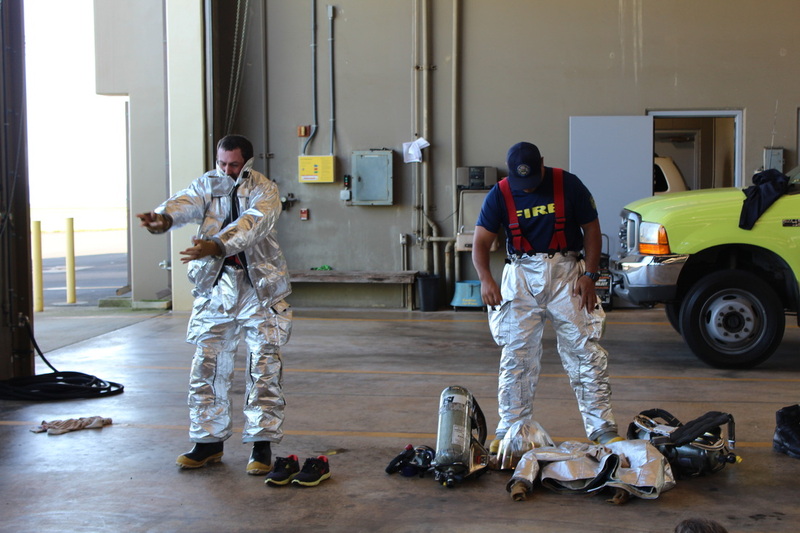 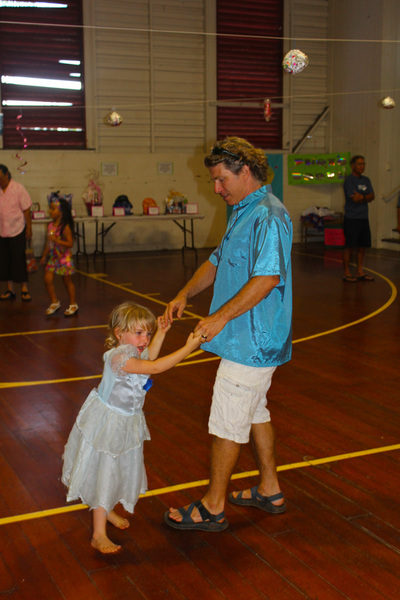 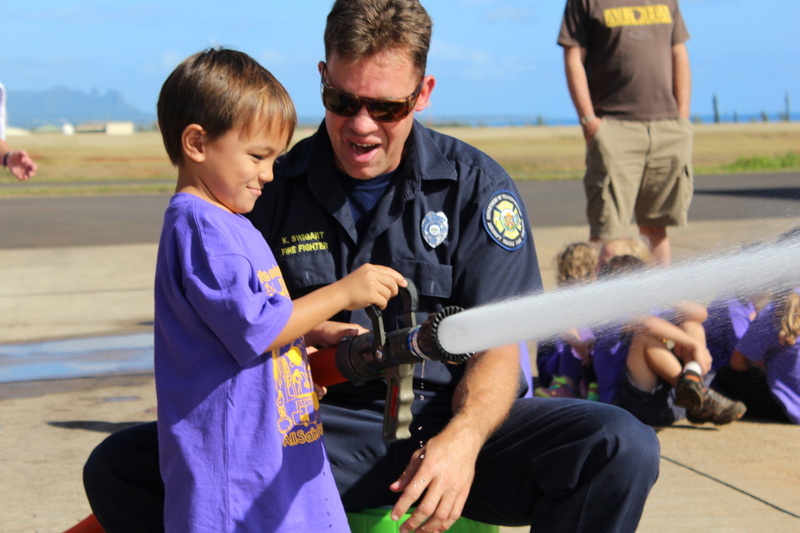 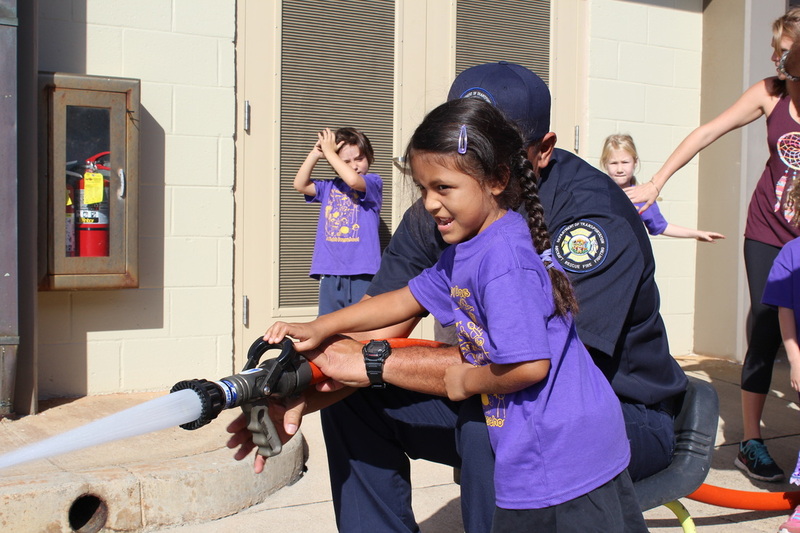 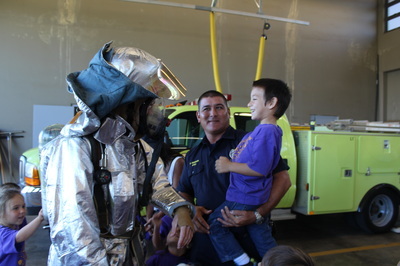 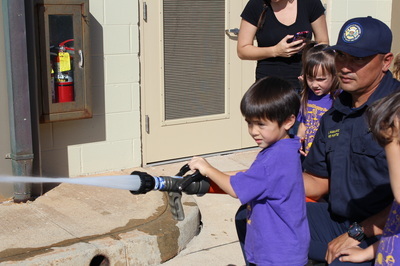 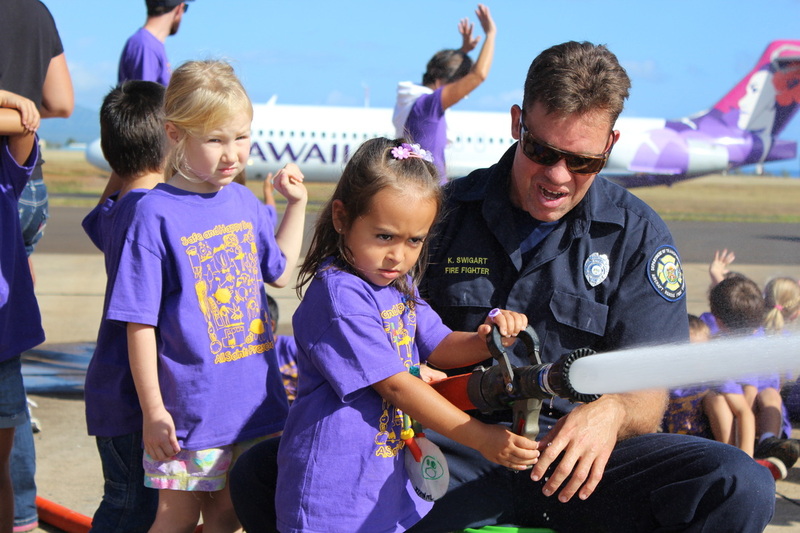 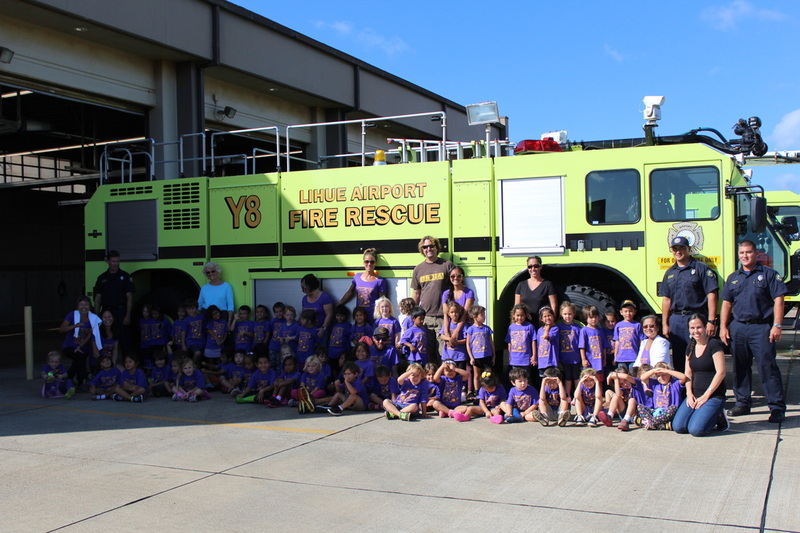 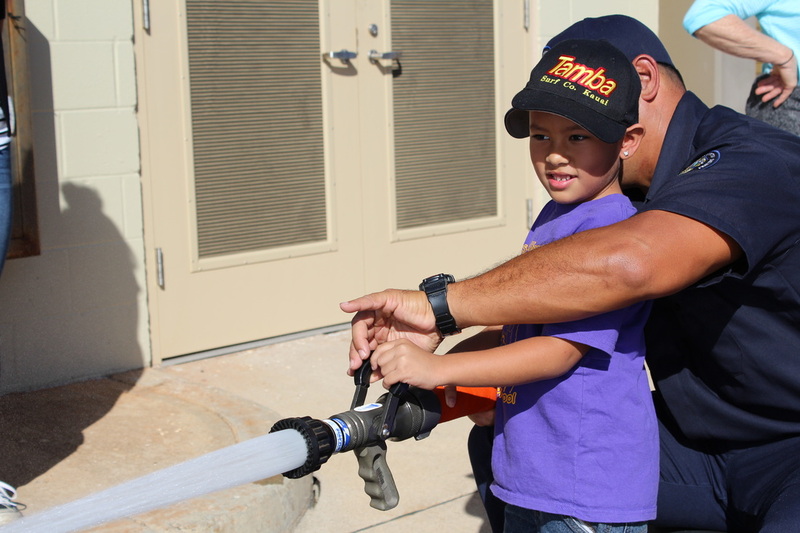 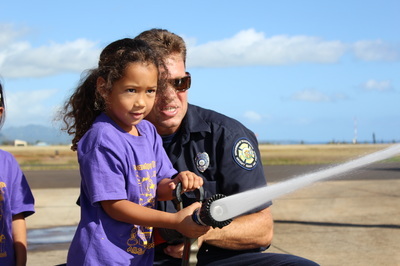 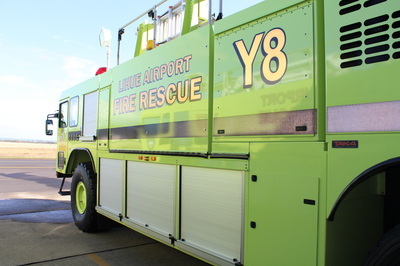 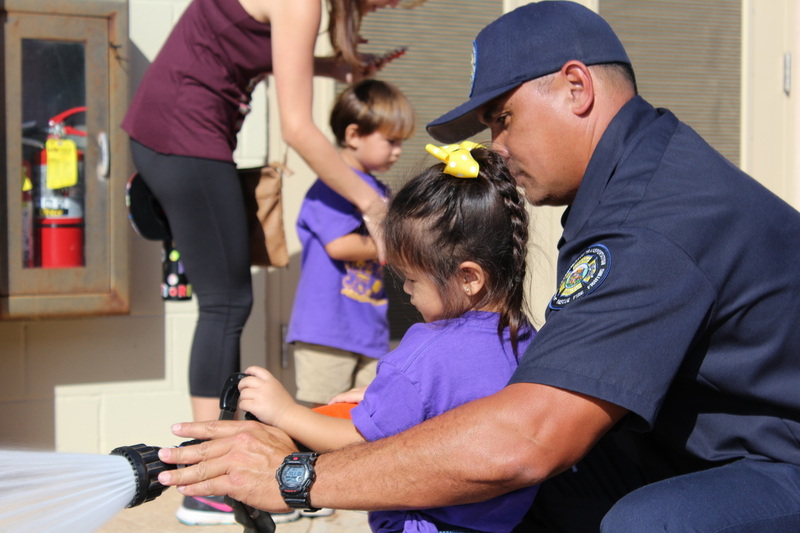 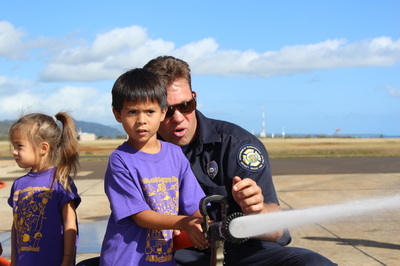 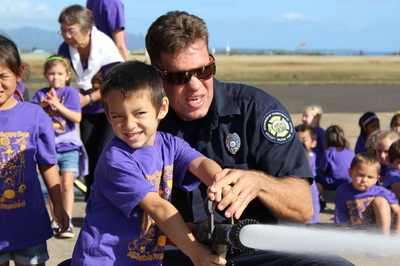 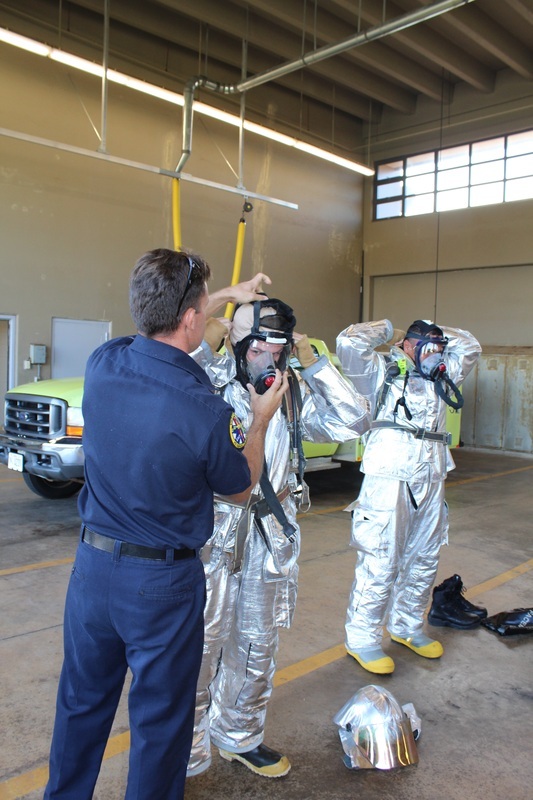 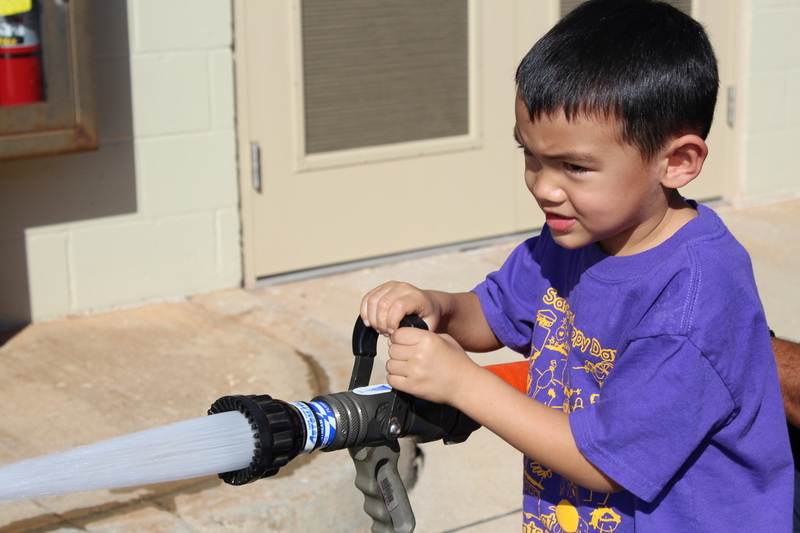 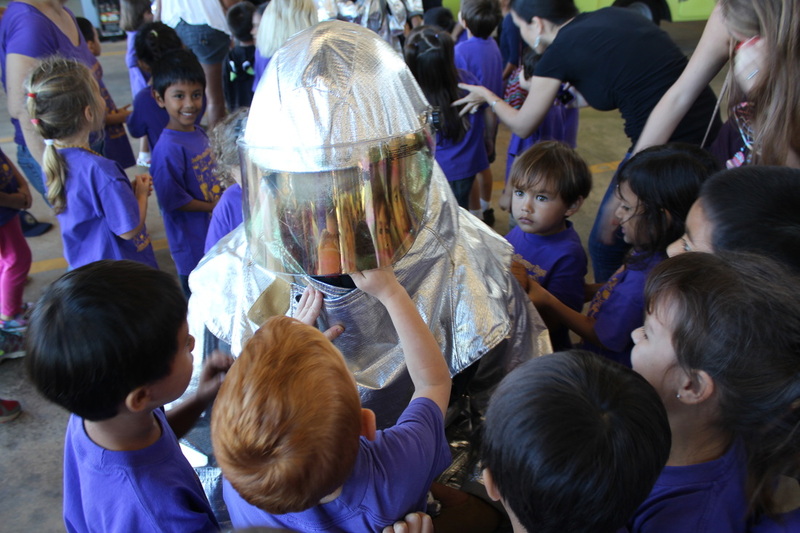 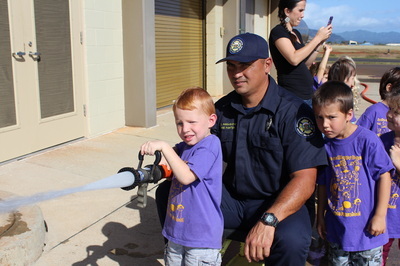 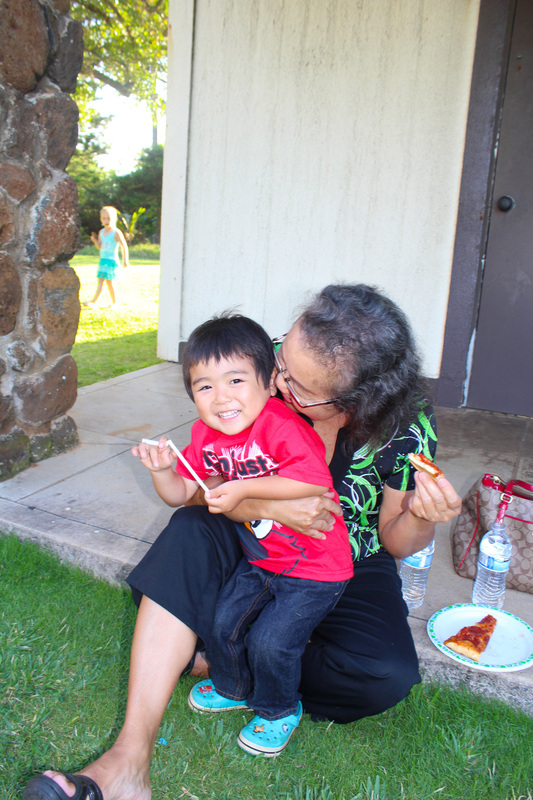 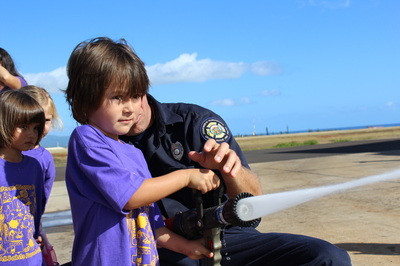 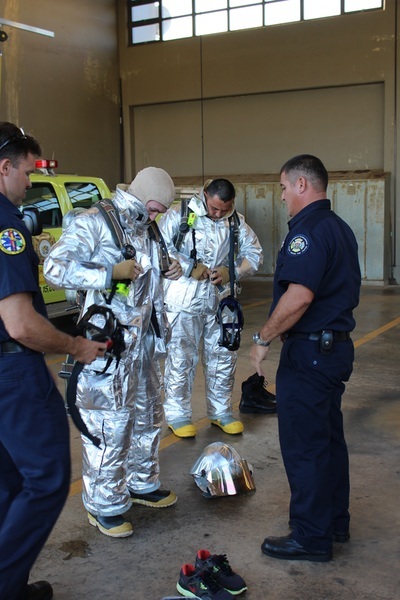 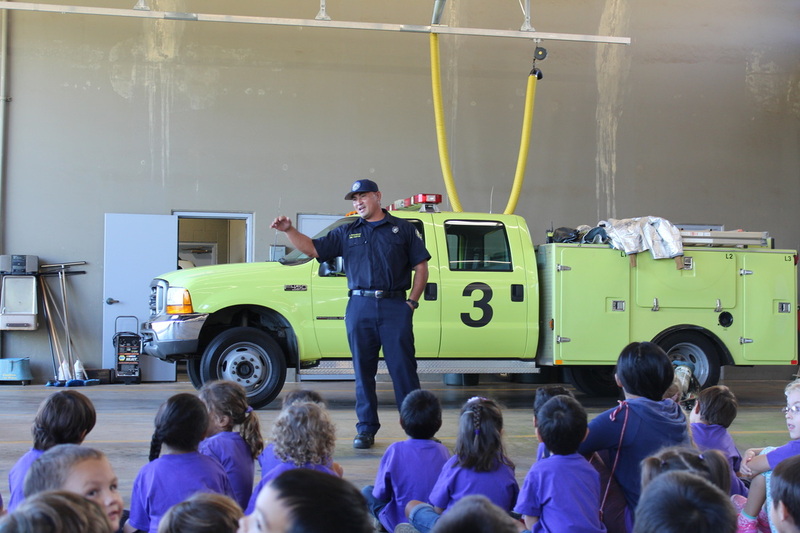 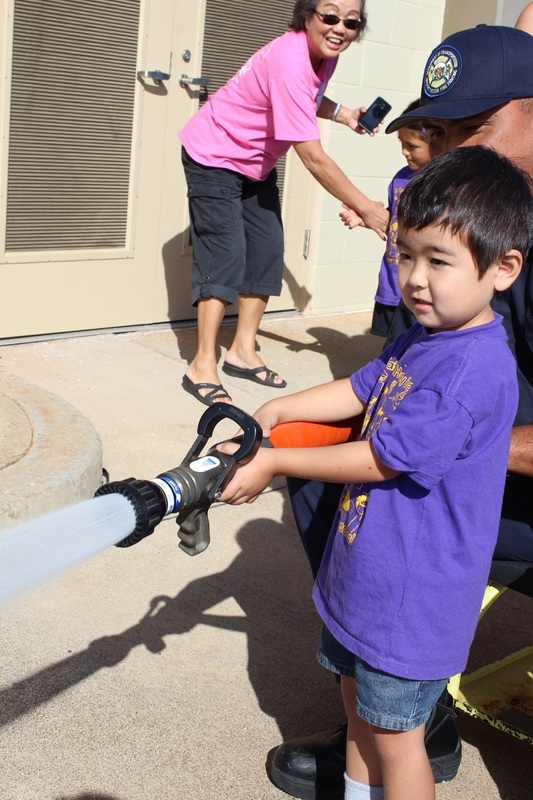 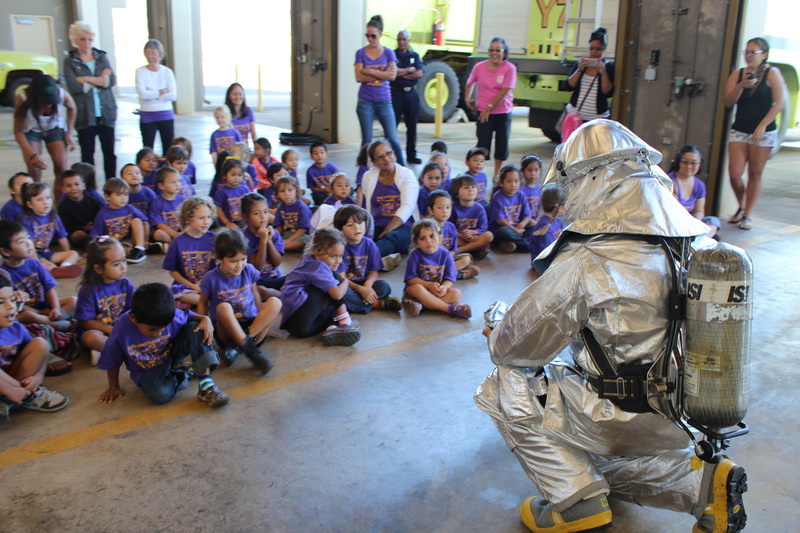 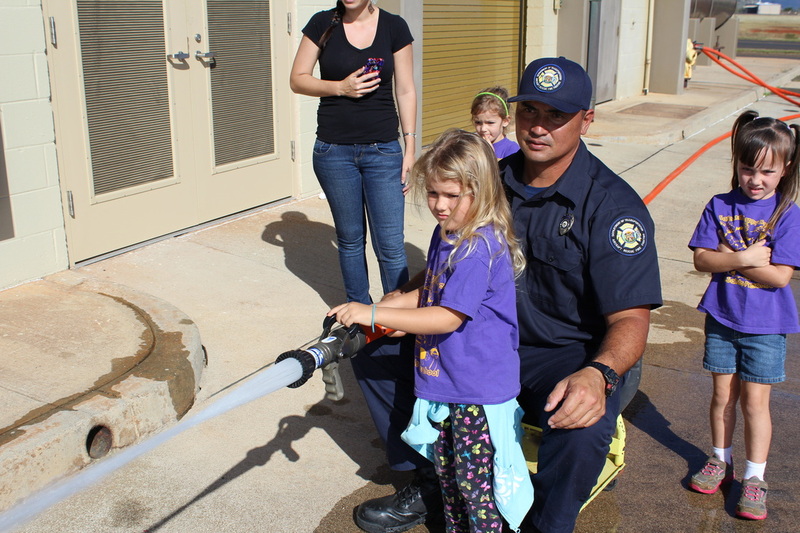 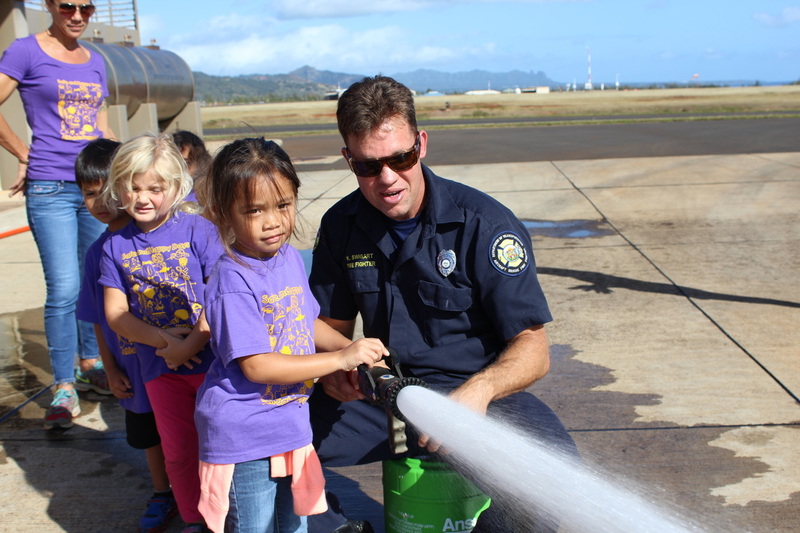 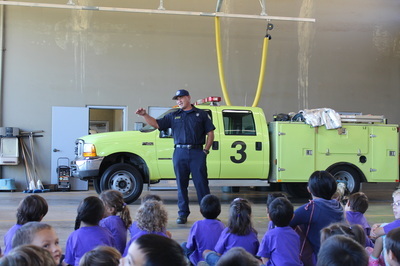 On Friday, January 30, All Saints' Preschool visited the Lihue Airport Fire Station. 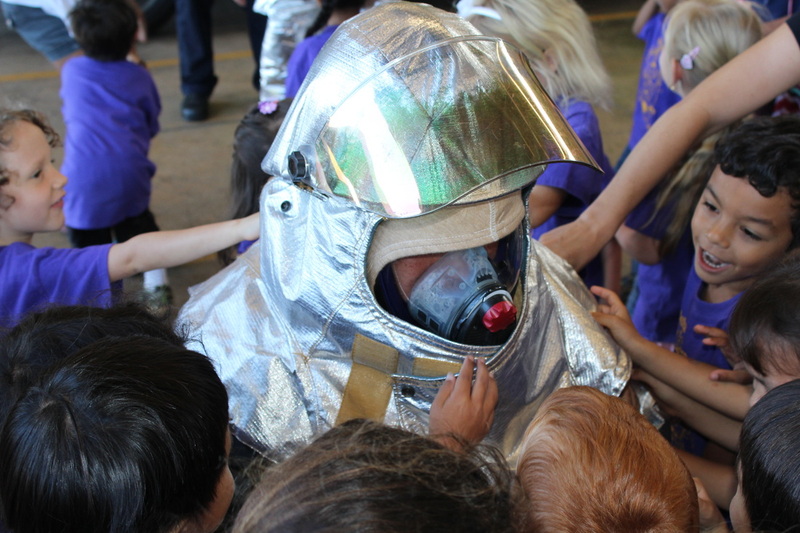 Students and teachers got to see the special clothing and gear the firefighters wear to fight a fire. 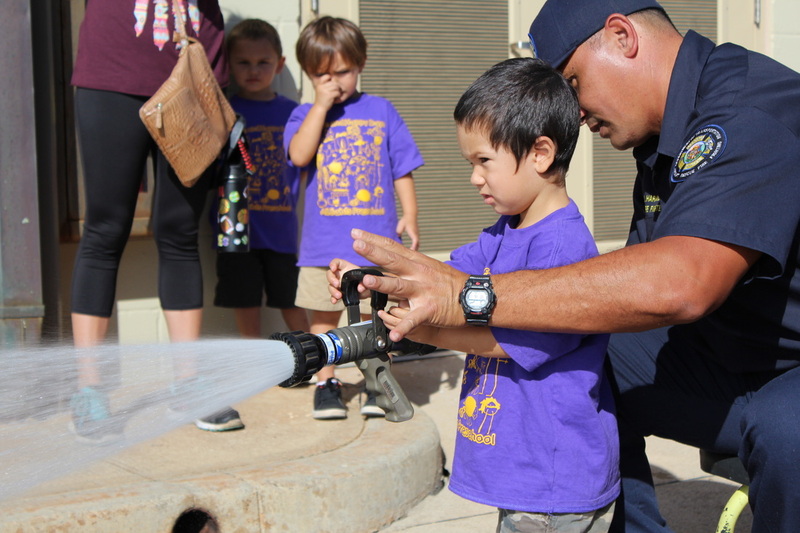 They toured the fire station and got see a fire truck spray water out of a special high-powered water canon. To finish off their visit and training, students got an opportunity to spray water from a real fire hose. 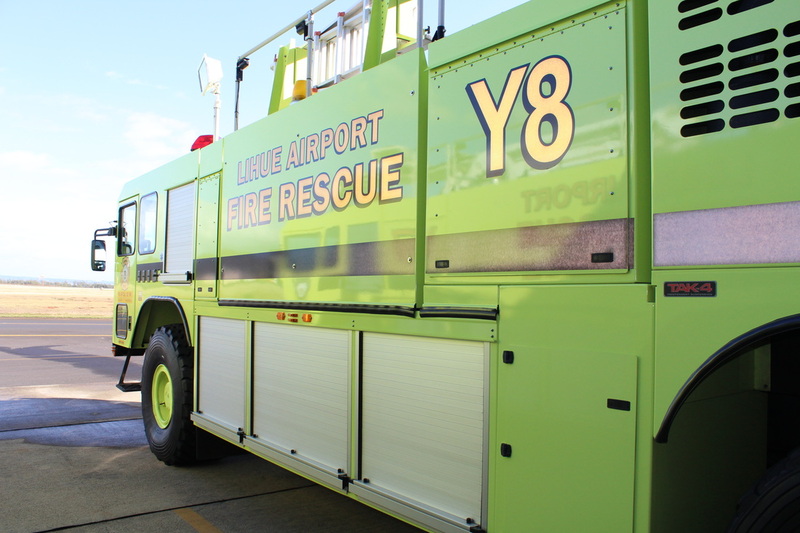 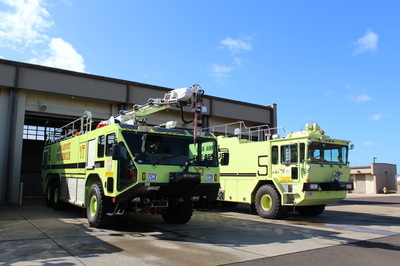 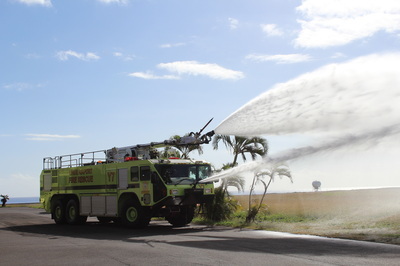 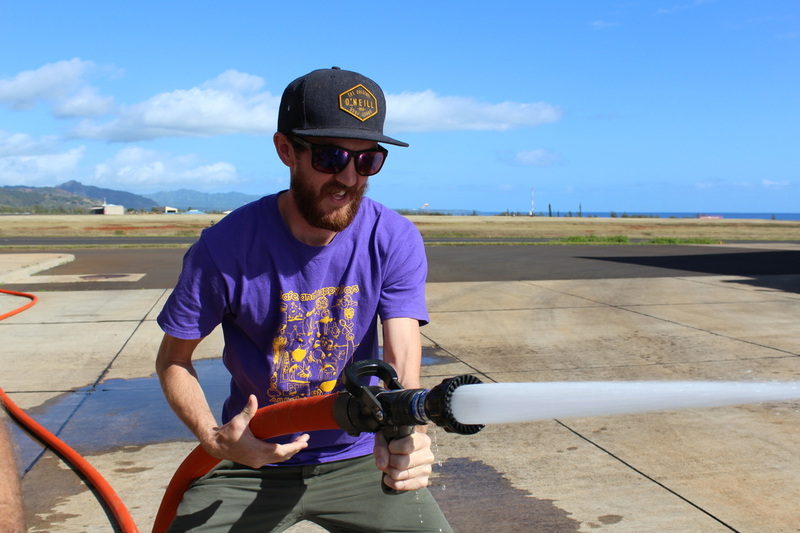 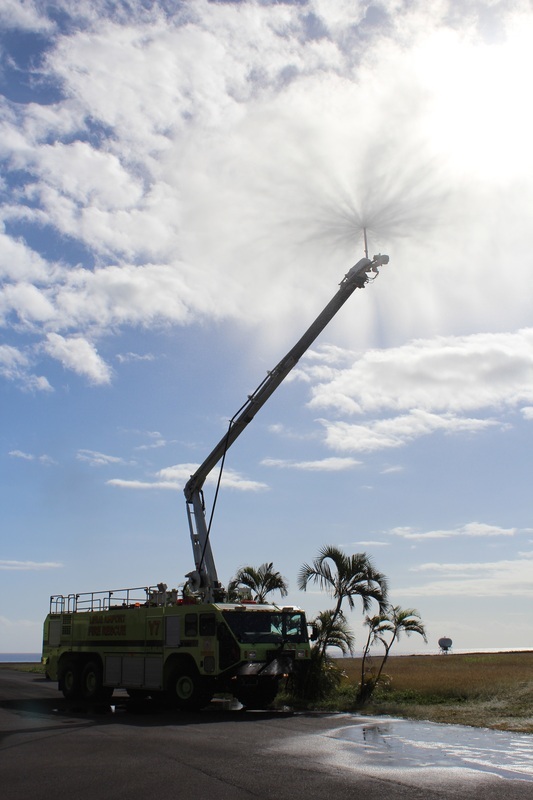 Mahalo to the Lihue Airport Fire Station!